Author’s note: I wrote this post about a year ago, but never published it because I couldn’t wrap it up tidily with a neat conclusion. Buuuut considering the sudden and recent renewed interest in decluttering thanks to Netflix’s new Tidying Up series, I thought I’d go ahead and publish it as it is. Let me know what you think! I’ve been coming across a bit of criticism of minimalism lately. I’ve written a fair amount on the subject in the past, so I always perk up when I hear it mentioned. So I thought I’d take a look at some of these critiques and offer some counterpoints. But first off, a definition and some clarifications. “Minimalism” can be used to define a certain kind of aesthetic as well as a lifestyle. They do not necessarily overlap. Minimalism as an aesthetic is generally recognized by pared down design elements. Most people conjure up mental images of monochromatic colour schemes, clean lines, bare walls, and a perfectly-matching “capsule wardrobe.” Lots of neutral colours, white paint, and sparse decor. Simplicity. Minimalism as a lifestyle (at least as far I understand it) means intentionally choosing to own fewer possessions. It means paring down to what is essential in life, and getting rid of excess. It’s about letting go of whatever isn’t serving you. This can look different ways for different people. Like I said, I don’t think these two forms of minimalism necessarily go hand-in-hand. 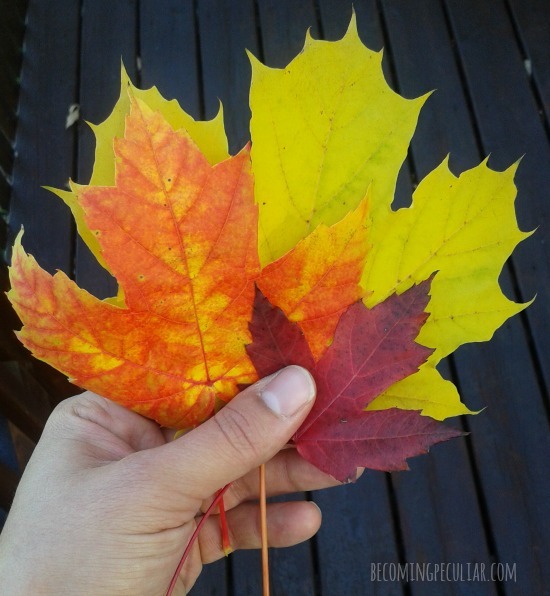 I think you can practice minimalism while still adorning your house and body with lots of colour and flourish. I’ve written before about what I think are the merits of a minimalist lifestyle, so I won’t go much into it here. In short, I think minimalism can bring freedom, and is generally good for our (mental, physical, and spiritual) health, as well as the planet. Below are a couple of critiques I’ve recently heard regarding minimalism, and some of my thoughts on them. There are a million variations [of minimalism] – fitting all your belongings into a single box, small-house or van living, radical de-cluttering, extreme purges of technology or social activity, etc – but they all hold the same vague, usually unspoken level of superiority. Okay. So: do minimalists think they’re morally superior? Well, sure, some of them probably do. Maybe even lots of them. But isn’t every subculture susceptible to this kind of snobbery? Even ones that are supposedly based in humility, like Christianity? I’ve heard people complain about the same kind of thing from vegans, democrats, globetrotters, health/fitness fanatics, academics, and artists. And they’re probably right — to a degree. It’s a problem you’ll find within just about any group, whether it’s centered around a certain philosophy, career path, political affiliation, lifestyle, or religion. We choose these paths because we think they have merit. We think they’re good. And within any subculture, some people are going to be snobs about it. You can be pretentious about your lifestyle choices or you can be humble about them, whatever they may be. I’ve heard people be smug and moralistic about their literary tastes. I’ve heard people humblebrag about where they choose to live (i.e. rural vs urban setting). I’ve heard them speak paternalistically about how they spend their money (“Ahem… We value experiences over things”). I’ve even heard people argue haughtily about whose income is further below the poverty line. I’ve also known some truly humble minimalists, who just don’t want to be caught up in materialism, and are using minimalist principles to make ends meet. There’s nothing inherently pompous about choosing minimalism — no more than anything else. And have I ever been douchey about minimalism? Yeah… probably. Sorry about that. I’m a human, and was born desperate for love and validation. I’m trying to do better. I’ve been hearing this one a lot lately. In the article I quoted above, the author argues that “the only people who can ‘practice’ minimalism in any meaningful way are people upon whom it isn’t forced by financial or logistical circumstances.” In other words, poor people don’t have the freedom to choose minimalism. They already don’t have enough. Therefore minimalism is only for the privileged. There is definitely some merit to this argument. Yes, minimalism requires a certain amount of privilege. Truly impoverished and marginalized people don’t have to resources or social capital to “konmari” their homes. But you don’t have to be wealthy to choose to pare down your possessions or to choose to live with less than your neighbours. You don’t have to buy one pair of $200 jeans so you can turn up your nose at the rest. 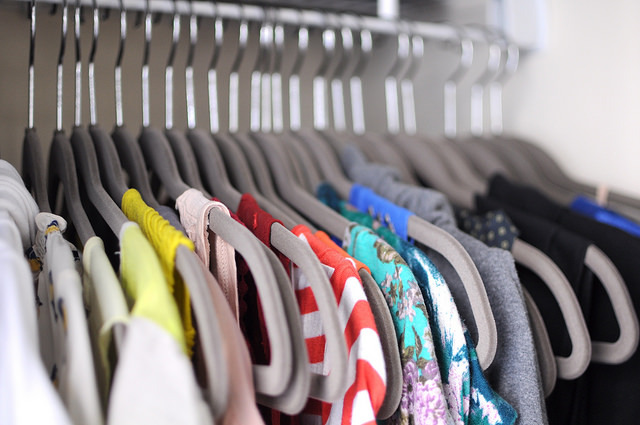 You can totally be a minimalist who shops at thrift stores. In fact, I’ve found that minimalism has made it easier to live on a budget. And part of the reason I know this is because I’ve heard so many lower-middle-income people say that minimalism has actually helped them live on a budget. Striving to own fewer possessions makes it easier to get by on less. 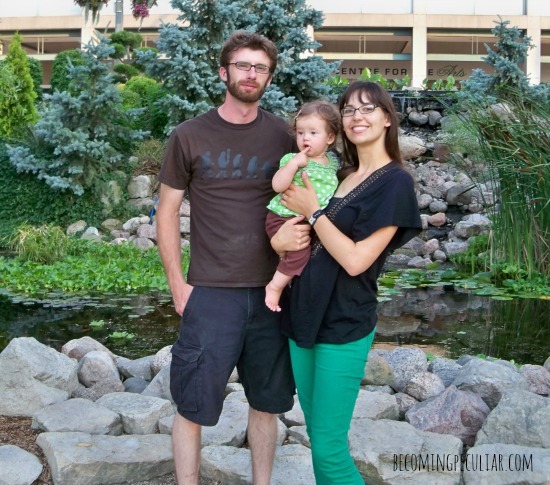 My own family lives on an income below the poverty line, and minimalism helps make that possible. It’s partly because I don’t have a huge wardrobe, or buy the kids a ton of toys, or own a lot of electronic devices, that we can afford to survive on one small income. I heard this criticism come up on a podcast that I actually really love, called The Upside Down Podcast. The hosts attempt to differentiate between minimalism and “downward mobility.” “Downward mobility,” they argue, is a lifestyle choice focused on the well-being of others. Minimalism, by contrast, is just about improving your own life and your own well-being, so it’s not inherently Christian. However, I think this contrast is based on a false dichotomy between helping yourself and helping others. I don’t think these two things are necessarily mutually exclusive. Sometimes, helping yourself is also good for the people around you. Choosing minimalism for your own benefit is not like greed, wherein your help yourself at the expense of someone else. I think practicing minimalism can be mutually beneficial, to you and the people around you. Of course, minimalism is not automatically or inherently helpful to the people around you; but I think if done well and with the right spirit, it can benefit others beyond yourself. If you pare down your possessions to the things you actually need and use, you can give the excess to people who could make use of those things. 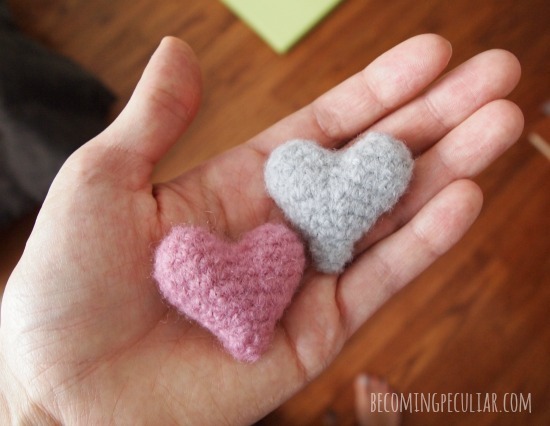 Instead of hanging onto things that will just gather dust in your basement, you can share them with people who might actually use and appreciate them. Less clutter in your own life can also bring you more peace, time and energy, that you can then share with others. So do I think minimalism inherently Christian? Well, no, of course not. You can be a minimalist and a totally self-centered douchecanoe. 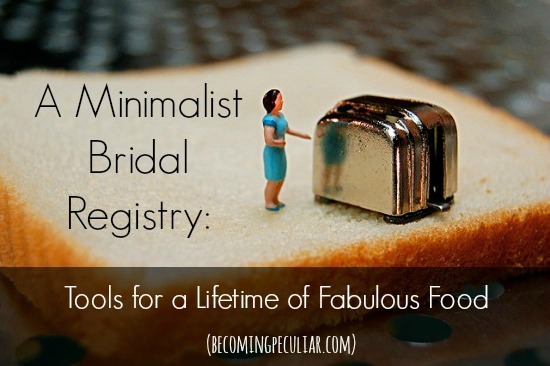 And you can totally be a Christian without practicing minimalism. But greed, by contrast, definitely is NOT Christian, and I think minimalism can be a very useful tool to fight against greed. Some of the central tenets of Jesus’ message include generosity, sacrifice, sharing, and equity. His gospel is about lowering yourself and lifting others up. I personally think minimalism aligns with that message, if it is done with a spirit of generosity and love. So these are just a few of my thoughts when it comes to criticism of minimalism. Sometimes I feel sad that I don’t make any money. I’m doing something different today: I just opened up my laptop and wrote what was on my mind, and am publishing it with minimal editing. Even though I recently said I prefer works that are heavily edited. Hey, it’s my blog, I can break my own rules. Sometimes it feels good to just share my feelings, knowing that some of you will be able to relate. I’m not asking for sympathy or advice or — heaven forbid — money. I just felt like being honest about my feelings. This morning I woke up sad that I don’t make any money. In fact, I’ve spent most of my adult life actively resisting a capitalist-centered life, favouring self-sufficiency and time with family over earning an income. I would rather learn to DIY everything than work at a job to pay for those same things. “Our home is a unit of production, not consumption!” my husband and I routinely remind ourselves. And for the most part, I’m happy with my life choices. I believe that my work is meaningful and important. I don’t feel especially deprived most of the time: on my husband’s small income, we can afford to cover all our basic needs, plus a little extra to cover my hobbies (i.e. 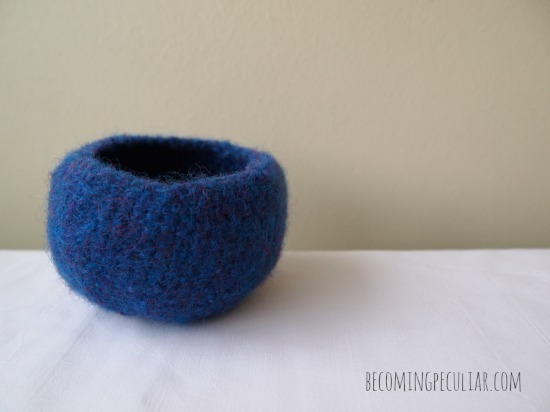 blogging, painting and knitting), the occasional dinner out, and clothes that I feel good in. So it’s not that I wish I had more money — not really. I just sometimes crave the validation that an income would provide. Sometimes I long for the knowledge that someone out there values my labour enough to want to give me money for it. Possibly even — and this is totally wild — a living wage. Like, I can’t even fathom the thought of someone wanting to give me enough money that we were officially living above the poverty line. How luxurious that seems! Can you imagine walking around, knowing that your skills, time, and effort are worth actual money? Like, that your labour is so coveted that an employer or a client would be willing to part with actual cash in exchange for it? Man. What a dream. I can hardly even picture it. And I know some people get to experience that feeling, and sometimes I feel just a little bit resentful. At my last three jobs, I was paid minimum wage, and even then I felt like a burden on my employers. Like I was barely worth the amount of money they were dishing out. Like they’d replace me in a heartbeat if they could just find someone else willing to drive out to their remote location and do the work. I have been working SO HARD my entire life. I worked so hard to get straight A’s in high school while working on weekends to support my family. I worked so hard to get straight A’s in university while paying for my own tuition plus room and board. I worked so hard at my first minimum-wage jobs. And I have worked harder than ever, around the clock, as a mother. I don’t feel like I’ve had adequate leisure time since I was in elementary school. And sometimes I just can’t believe that all this hard work has not resulted in any kind of capital. I am 33 years old with a master’s degree and I can’t even imagine what it must feel like to make enough money to pay for my own root canal. I bet a lot of you can relate, especially if you are a millennial mother or an artist. It is hard to find someone willing to pay us for our work. We are expected to provide so much of our labour for free. I’m not even sure I want any other life. But in a capitalist society, where our value comes from how much we earn and spend, sometimes it just feels sucky to not make any money. Related: a few years ago I wrote about post entitled, “I Am Rich,” about how my family is rich in other resources. First off, I just want to be clear that I am not profiting in any way by writing this. No one is paying me or giving me any free stuff or even asked me nicely to say anything about their products. These are just some of my thoughts from my own personal experiences. And I have absolutely nothing against doTerra. From everything I gather, it’s a perfectly lovely organization selling wonderful products. This is just an explanation of why doTerra ended up not being a great fit for me. I started buying doTerra products about six months ago. I don’t have any complaints about the products, but I think I’m done with the company. If you didn’t already know, doTerra is a multi-level marketing (MLM) company — you know, like Avon or Tupperware, or more recently Plexus or Scentsy . . . one of those companies that often puts you in the awkward position of having your loved ones invite you over to try to sell you stuff, and then trying to get you to sell stuff to your friends. They sell essential oils and other related products. MLM companies work by recruiting people to become their distributors/salespeople, usually with the promise of discounts on their products plus the opportunity to earn commission. Distributors sell products directly to consumers by means of relationship referrals and word of mouth marketing. They then in turn try to turn their friends into distributors, because this means even more discounts, free products, and/or more commission, plus other possible perks (think trips to Hawaii). Overall, I don’t think there’s anything terribly wrong with MLM. DoTerra in particular seems to have a good heart, provides opportunities for stay-at-home moms to earn an income, and I know they do charity work, too. 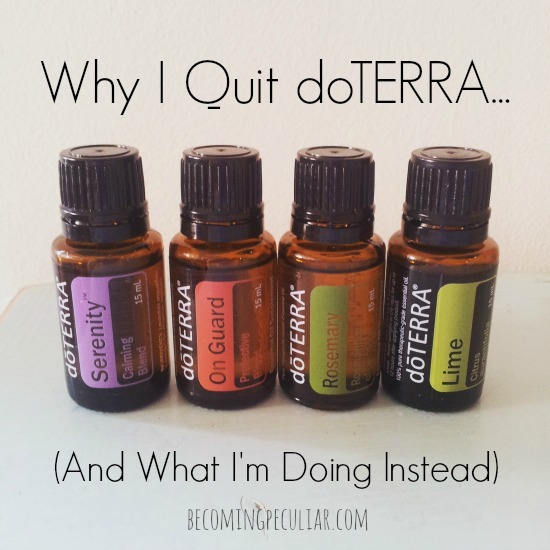 There are a couple of aspects, though, that just weren’t a good fit for me, especially when it came to doTerra, and I’ll be focusing on these. My story with doTerra starts simply enough, as it does for most people: I wanted to buy some doTerra essential oils. To be clear, I never had any interest in selling them or making a profit. That just wasn’t in my agenda. I had heard good things about their products, and was drawn to some of their “proprietary blends.” I wanted to give them a try. But in order to get them for a halfway affordable price (a.k.a. “wholesale prices”), you have to sign up to be a distributor. And that comes with a membership fee. So I signed up. Buying a membership makes you a “wellness advocate” (which I found a hilarious title from the start) and you get a whole packet of information explaining all the various programs you can sign up for to get further deals. All of discount programs, I soon learned, involve first buying more products, selling to others, or recruiting other distributors. You are generally rewarded with discounts on additional purchases or free products. For example, there’s a “product of the month” loyalty program where you have to sign up for monthly purchases, meet a minimum purchase requirement, and have them shipped before a certain date of the month. Only then do you qualify for a free monthly product of their choosing, which you may or may not even want. Other loyalty programs also allow you get a certain amount of “points” back which you can use towards future purchases. But again, you first have to commit to buying or selling a certain amount of product every month to qualify. There are so many stipulations and minimum purchase requirements, and then many of the products I wanted (like the diffusers) didn’t quality for the discounts. I quickly found these requirements far too constraining, and even found myself buying things I didn’t necessarily want just so I could earn points to make the whole program worthwhile. But without signing up for any of these programs, the products remained unaffordable. Now I’m just a simple Mennonite girl with a degree in literature. I felt like I needed a business degree just to make sense of all the offers and programs to get a decent price on the products. I knew I was spending more than I wanted. For what? Finally, I decided enough was enough. All I wanted were some oils in the most economical way. Was that too much to ask? I think my eyebrows first started to rise when I saw a photo on Instagram from DoTerra of their conference. “Over 10,000 flowers are being arranged for centerpieces on 540 tables for the Gala tomorrow night. #doterraalive,” the caption read. Maybe I’m miserly, but that struck me as an excessive amount of flowers. We’re not celebrating the commencement of world peace here. This is a corporation that has developed some new products to sell, and are preparing to unveil them to their sales team. 10,000 flowers? 540 centerpieces? Is Jesus going to be there?? Again, I come from a Mennonite background, where we celebrate huge life events by adding jam to a feast of bread and butter in the unadorned church basement. At my wedding there were exactly six flowers — in my bouquet, which we picked up for $2.99 from the grocery store on the way to the church. So maybe I’m not the best judge of opulence. I will fully agree that there’s absolutely nothing wrong with lavish conventions and parties. I just don’t necessarily feel like paying a premium for a product so that the company can fund such events. I’d personally rather go with a more modest company who just wants to sell their product in an economical (but still honest) fashion. I’m not interested in the fanfare. Look, I don’t mind paying for quality. I’ll gladly reach deeper into my pockets for products that support my values (fair wages for workers, earth-friendly practices, etc). I’ve written before about how I’m willing to pay a premium for organic, local foods, for example. And doTerra does sell really excellent products, I won’t deny that. However, I just felt like doTerra seemed to be spending too much on marketing. Too much was spent on rewarding top sellers, on fancy galas and conventions, on luring in new distributors, etc. Moreover, I’m Canadian. When I signed up with the Canadian branch of DoTerra, I was under the impression that the prices on the site were in Canadian dollars. Because I’m not too bright, it took several very large purchases before I realized they were actually in US dollars. With the plummeting Canadian dollar, this makes doTerra oils (which are expensive for Americans) obscenely expensive for Canadian buyers. 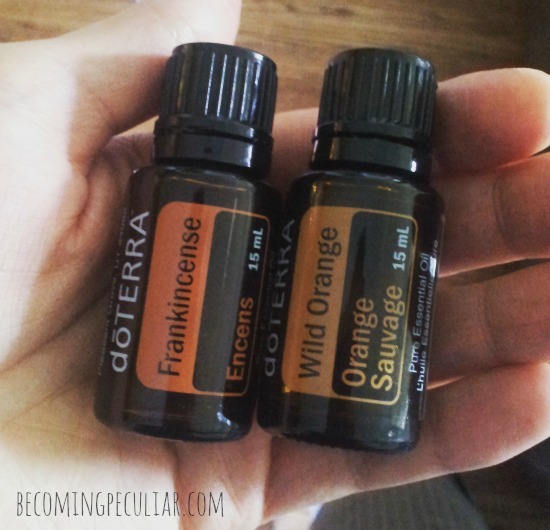 A 15ml bottle of frankincense, for example, which is $73.94 USD (wholesale), is $97 CAD. Holy crap! That’s a week’s worth of groceries for me! I know that doTerra advocates will tell you that only doTerra products are “certified pure therapeutic grade” (which they are, since they’re the ones who made up that term), and that they’re the only ones you can trust to be totally safe. (Young Living distributors will say the same about their products). But I did some digging around, and found another company that seems to be their equals in quality, but for a much smaller price tag. I’m not convinced that doTerra (or Young Living, for that matter) have cornered the market on high-quality essential oils. But they are by far the most expensive. I suspect it’s mostly for the reasons I’ve discussed above — tons of money poured into marketing and fanfare. When I complained on Instagram about the prices of doTerra products, a friend recommended Edens Gardens. I finally decided to check them out. The price difference was astonishing. I’m talking between 40-60% off on most products. So I decided to get serious. I did some research and I made some purchases. Here are some features of Eden’s Garden that won me over. Stupid simple: you see which oils you want on their website, you buy them. No commitments, no membership fees, no complicated rewards programs, no grandiose titles. No nonsense. Much greater selection: doTerra offers around 45 different single essential oils and 20 blends. Edens Garden, on the other hand, sells about 131 single oils and 39 blends. You’re sure to find what you want! (Sure, doTerra sells all kind of other products like lotions, cleaners, supplements, etc, but I wasn’t interested in those). The one downside to Edens Gardens is this: shipping to Canada is insane. (In the US it’s fine — free for purchases over $50). It’s one of those bizarre situations where the more you spend, the more you have to pay for shipping. It doesn’t really motivate you to buy more! Fortunately I live close enough to the US border that I can have it shipped (free) to a mailbox in Detroit, and then hop over and pick up my package when it’s ready. But for other Canadians . . . you might not be so lucky. 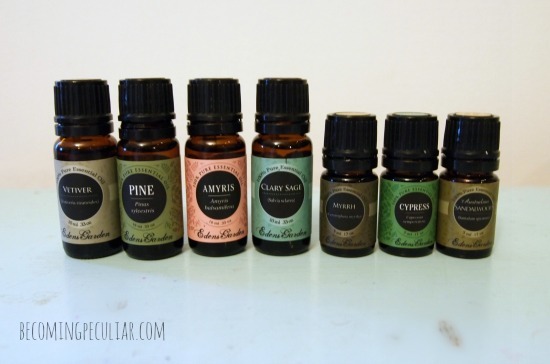 So there are just a few of my thoughts on a few different essential oil companies! I thought it would be nice to offer an honest, unbiased opinion where I can’t possibly profit. Again, a reminder: Edens Gardens has no idea I’m writing this. Just wanted to spread the word! 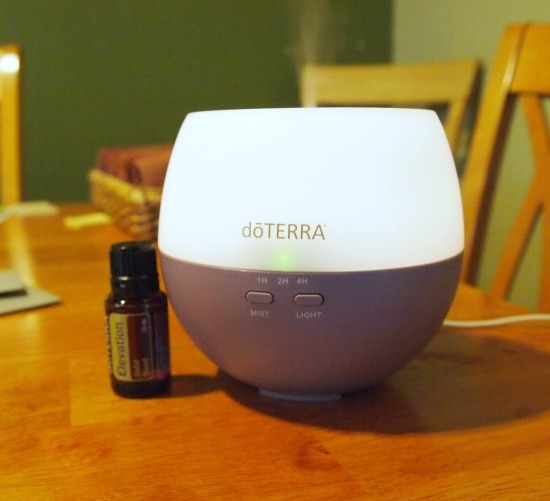 If you’ve been looking into essential oils, here’s an option you might want to consider! 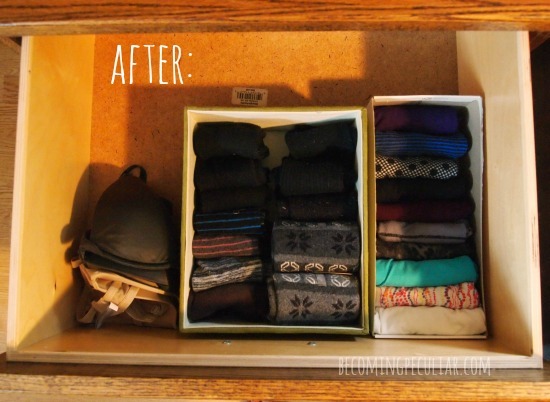 In my last post I discussed some of my favourite ideas from Marie Kondo’s The Life-Changing Magic of Tidying Up. 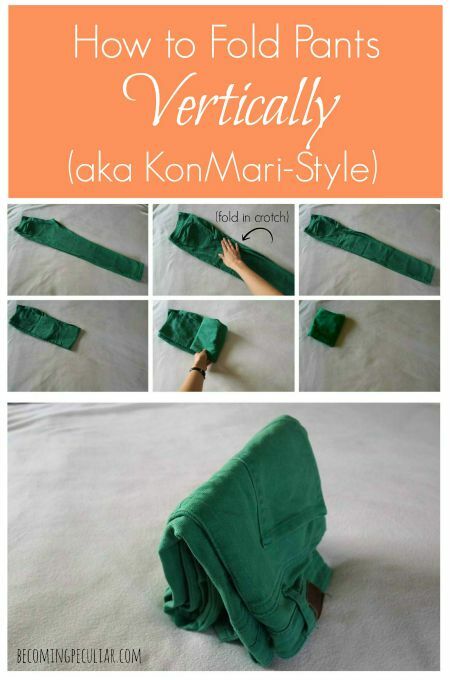 I love Kondo’s method of vertical folding so much that I wanted to devote an entire post to the subject. I had to head for the Interwebs to get help understanding Kondo’s suggestion to fold things so that they “stand on end.” What did she mean by that? I needed a visual. After watching this video, followed by this one, I finally understood. This is how I would sum it up: first, you fold an item into a long, thin, vertical rectangle (usually by folding it in thirds vertically). Then you fold that rectangle in halves or thirds horizontally, from the bottom up, until you end up with a tidy little package. Then you can stand it up on end in the shape of an upside-down v.
If it helps, watch this video. In the first row you can see me folding he shirt into a long, vertical rectangle; in the second row you can see me folding it horizontally into a neat little packet. Then voila! It can stand upright on its own! Each item will be slightly different in terms of how many times it must be folding to achieve that shape. The garment’s size and the fabric’s bulk will affect the outcome. You need to experiment a few times. Kondo says it will “click” when you get it right, and I have totally experienced that. 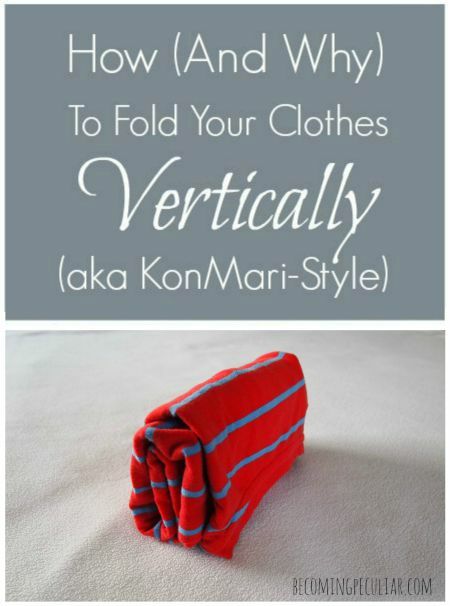 I’ll show you how to fold other items this way in a bit — first I might need to convince you just how awesome this method of folding is. 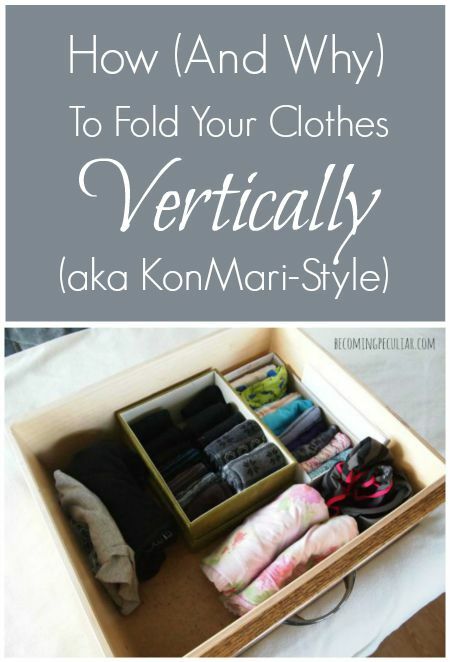 What’s So Great About Vertical Folding? You guys. 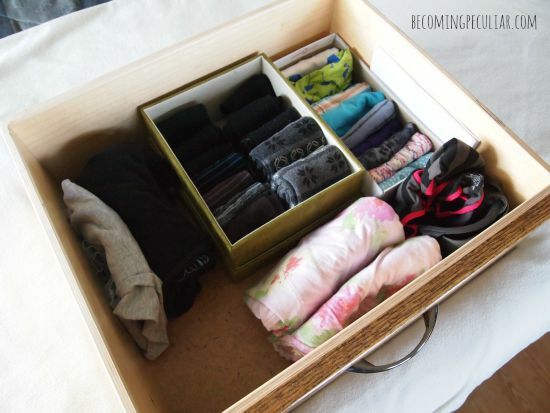 Once you start folding your things so that they stand on end you won’t want to stop. 1. It makes a ton more space. After folding my clothes vertically and utilizing a couple of shoe boxes to divide my things like Kondo suggests, I could fit twice as many clothes into a drawer. 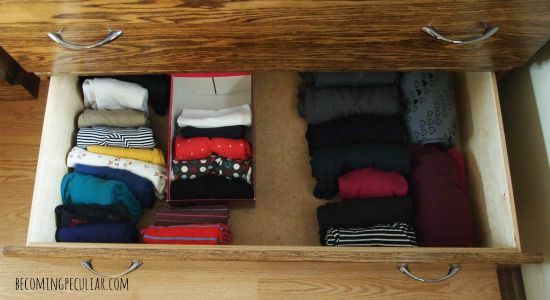 In turn, I was able to take things off of shelves and off the closet floor and organize them into the newly-emptied drawers in a much more efficient, attractive manner. With that lower drawer empty, I now had a nice place for swimwear, which was previously always just kind of stuffed wherever it could fit. Soon, everything has a place and there was no more stuff piled on my closet floor. 2. I can see everything at a glance. That makes it much easier to find and select what I want. No digging around and messing things up when I can’t find that one shirt. It also helps you keep track of your possessions. 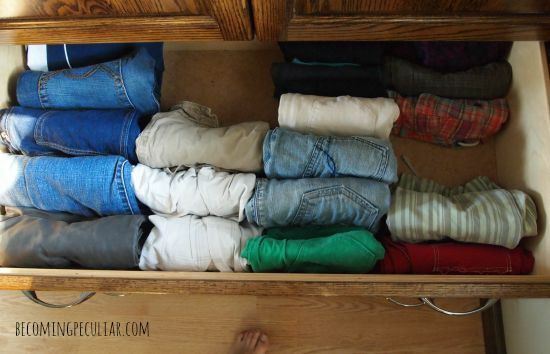 When you fold things like this, none of your clothes end up hiding under your other items for months on end until you forget about them. You get a much better sense of what you really have. 3. It makes every item I own feel more valuable. When I slow down to smooth each item with my hands and carefully fold it just so, I am encouraged to treasure each item. It makes every item feel like a precious gift. 4. By contrast, folding this way highlights the things I no longer cherish. It’s easy to ignore and forget about items that I just ball up and toss into a drawer until my drawers are bursting with things I don’t really like. KonMari folding encourages me to take more careful stock of what I own. It might force me to question why I even own certain things. If I feel irritated by having to take such care with an item that repulses me, that might be a sign that the item needs to go. I recently chucked some old, ugly t-shirts I was wearing to bed for that reason. It felt weird to carefully fold clothes I hated. 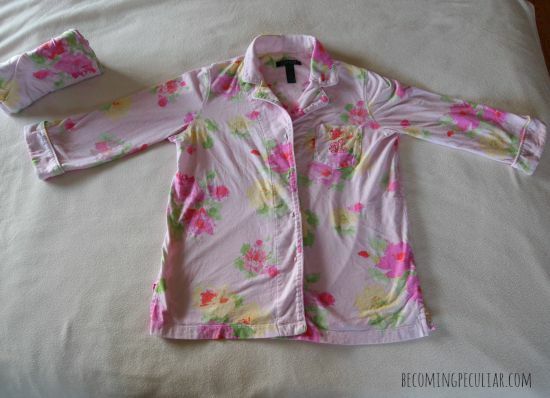 I replaced them with some pretty, matching, cotton pajamas which are a pleasure to fold. 5. It forces me to straighten up my environment so I have a surface to work on. You need a decent-sized workspace for this this kind of folding. I usually fold the clothes in my bedroom. Before I begin, I need to make my bed (if I haven’t already). I have been trying to get in the habit of making my bed as soon as I wake up in the morning; this is an added incentive to get the job done. 6. 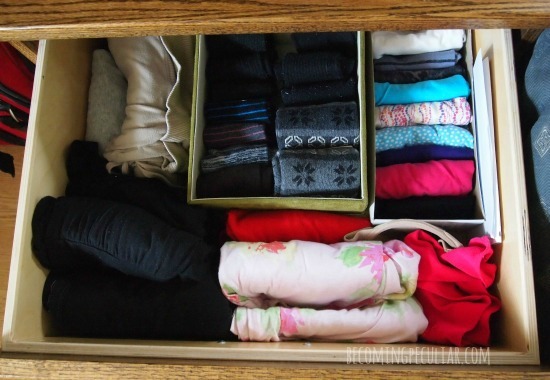 It’s very satisfying, making your clothes all crisp and tidy. I cant’ be the only one to feel this way. 7. Your clothes get less wrinkly. Nothing gets bunched up or flattened under the weight of everything above. 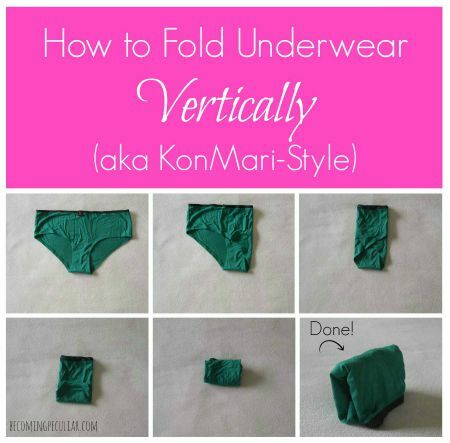 Fold in half, then fold in the pointy crotch part to make a rectangle. 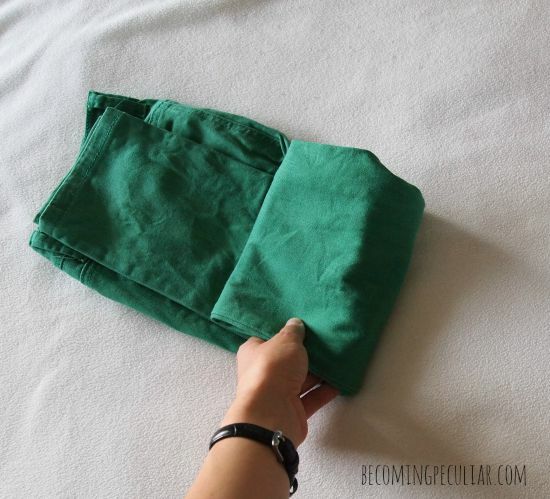 Then fold in halves and thirds until you have that neat little package. Again, here’s a video if you need some extra help. OK, so I hesitated to show you how I fold my underwear because I do have a little bit of dignity. But then I remembered I had a few pairs I hadn’t worn yet! These still have the tag on them. Okay? These are not underwear I have worn. There you go! Give it a try, I promise it’s awesome! After all these years, of course the inevitable happened one day: she took a ballpoint pen to it. At first I was relieved — Oh good, I can get rid of it . 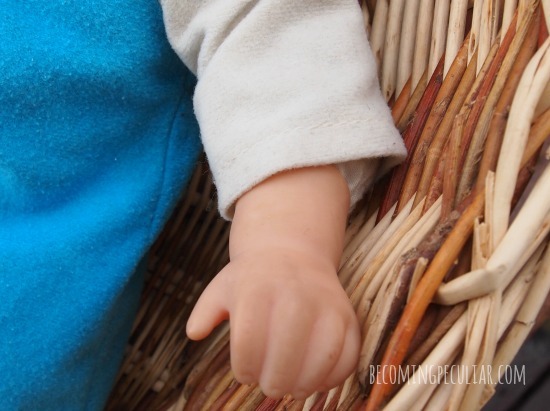 . . We have plenty of dolls, and this one’s already had a few years of use — but then I thought that probably wasn’t the most responsible approach. 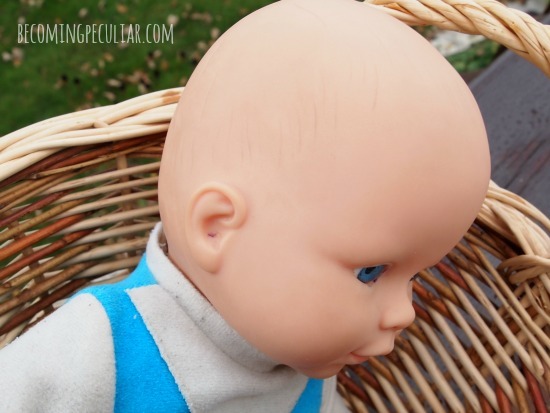 Some poor, underpaid woman in a Chinese sweatshop already made the doll — I ought to honour her work and take good care of it, even if they weren’t the ideal conditions in which the doll came to me. It was still in great shape other than the pen marks. I decided to hang onto it for a while longer. I decided I should probably do my best to restore it, in the hopes that it would get even more years of use. I tried a few easy, popular methods to remove the ink stains (e.g. soaking cotton pads in rubbing alcohol and nail polish remover and leaving them against the stains overnight) but they didn’t do much of anything. (In fact, my “before” pictures above are taken after these attempts.) I waited several months before doing anything else. So those ink stains were good and set. Then I happened to come across this post on Pinterest. (I honestly wasn’t even looking, it just showed up in my feed.) The author uses a very surprising secret ingredient to remove ink stains: acne cream! Benzoyl peroxide, to be exact. 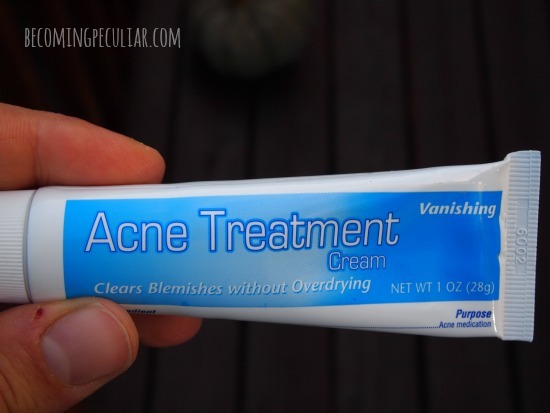 I remembered using that stuff as a teenager for my acne to no avail . . . but it sure did bleach the family towels! I was intrigued. The next time I was at my parents’ house, I peeked in their medicine cabinet. (Kids have lifelong free access to their parents’ medicine cabinets, right?). Sure enough, there was still an unopened tube of benzoyl peroxide that had expired five years ago in there. Bingo. I asked my mom if I could take it home for an experiment. Generously apply 10% benzoyl peroxide cream to the ink marks. Then, you put the doll out in the sunshine for a few hours. This is key. Try to face the areas with the pen markings towards the sun. I first tried this on a slightly overcast day near evening and it didn’t do much. I tried again on a really sunny day in the afternoon, and that’s when the magic happened. 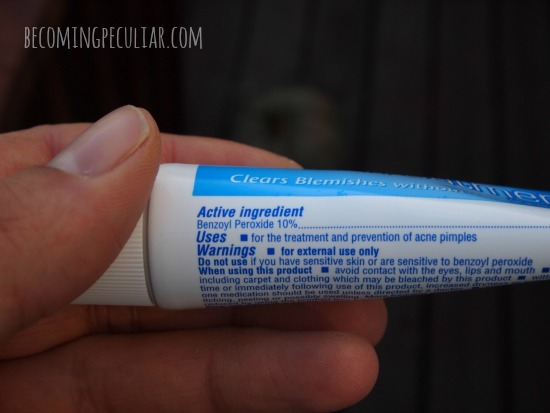 So benzoyl peroxide + bright sunshine = the magic formula. Then simply rinse off the cream with water. Take a look at the results! The ink is totally gone! And I definitely didn’t touch up the photos because I have no idea how. The only places where ink remains are deep in the crevices where either the cream or the sunshine didn’t reach. (Also on the eyes which are made of a hard plastic). 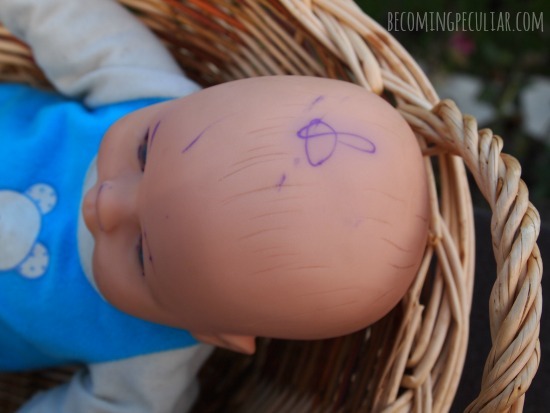 If I’d really loved the doll and wanted it to be perfect, I could have done this treatment a second time, being sure to get these areas. 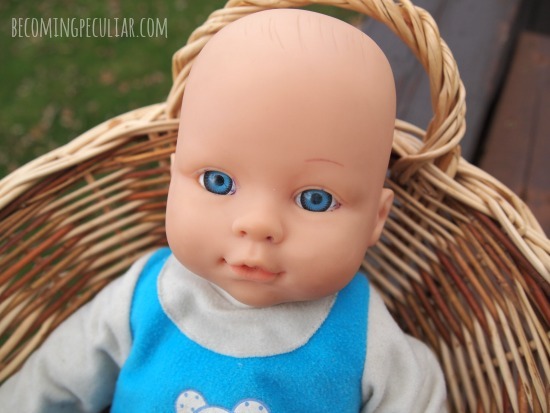 But for a cheapo doll I didn’t really care for in the first place, I was satisfied. 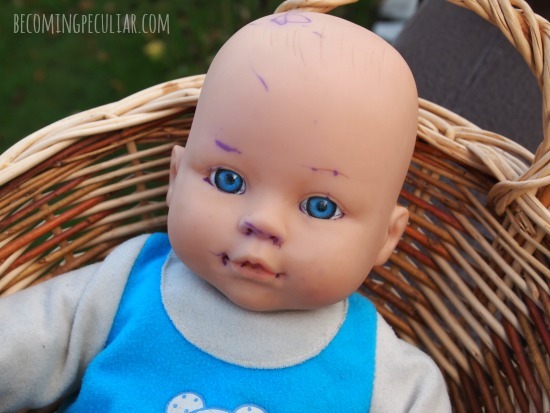 Note: you may notice that the doll is now missing an eyebrow. 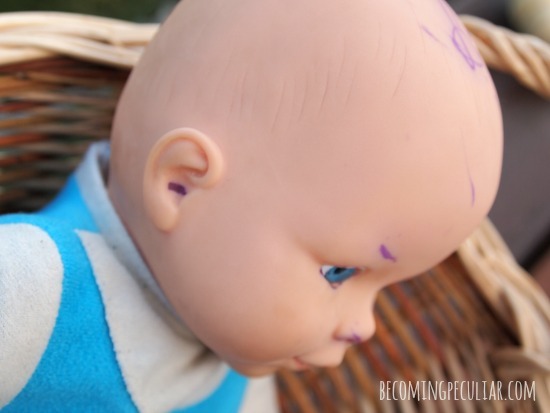 This treatment also removes the doll’s original painted accents. So be careful with these. In our case, my daughter had scribbled right over the eyebrow so I didn’t have much choice. There you have it! 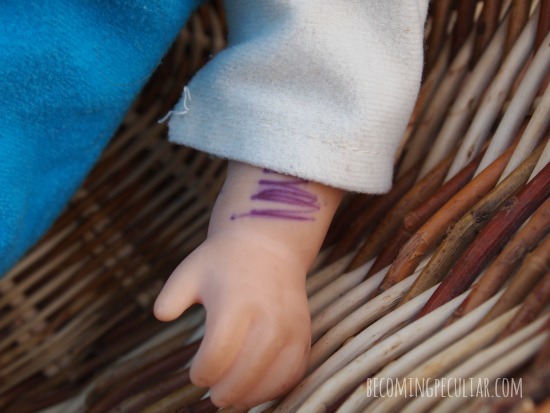 A simple, inexpensive way to get rid of ink marks on your doll. IF ONLY I had known about this when I was a little girl and my sister had scribbled all over my precious dolly! 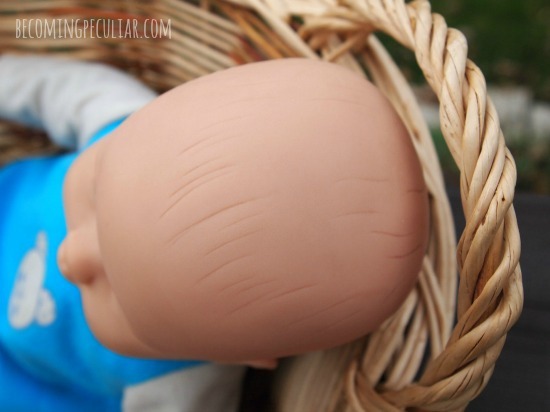 Warning: please use caution using this method on a really special or expensive doll. 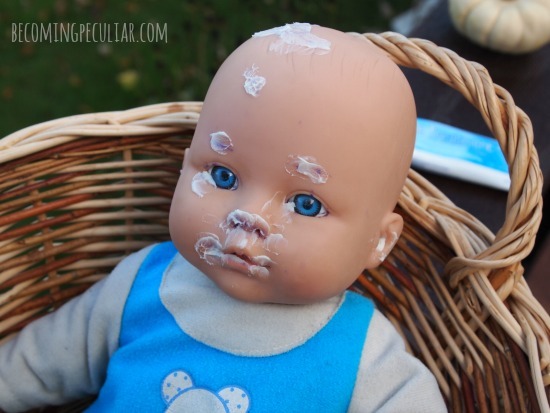 You might want to test a small patch in a hidden area before slathering acne cream all over your precious vintage doll. I can’t guarantee you’ll have the same results I had, or that it won’t damage your doll in some way! Thanks to Baby Toolkit for the idea! Lydia taking care of “her Felix,” now restored. I grew up getting my clothes exclusively from three sources: my older cousin, yard sales, and thrift stores. (Underwear was the one exception.) I didn’t get my first pair of new jeans until I was thirteen. I used my own money and bought them from a trendy store at the mall. I was very proud. I love thrift stores to this day because they’re very cost-effective and environmentally responsible. Until recently, I’ve always gotten almost all my clothes from second-hand stores. So before I go on, I want to make one thing clear: I am very pro thrift-stores. I shop them all the time for things like books and housewares, and particularly my kids’ clothes. In fact, in the absence of hand-me-downs (yay free! ), I think thrift stores are the perfect place to get kids’ clothes. 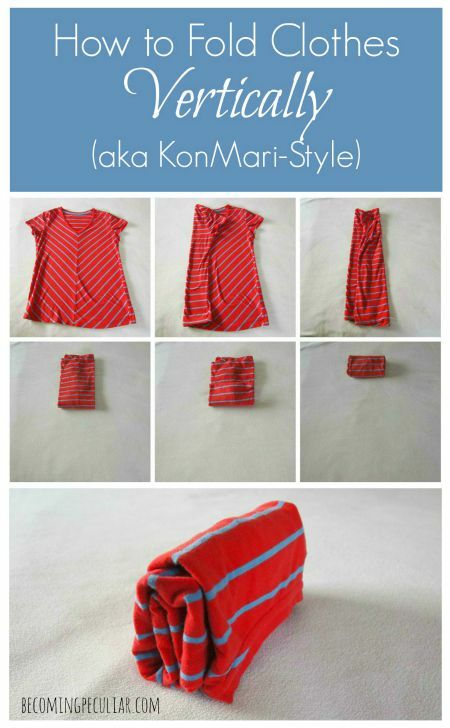 Since children outgrow their clothes so quickly, it only makes sense to use items more than once. Most of the clothing on the children’s racks are in excellent condition because they’ve hardly been worn. And they’re so cheap! Even at the nicest consignment shops I rarely pay more than $5 for an item. I realized recently that when I shop for clothes (for myself) at thrift stores, I tend to make poor choices. Because they’re inexpensive, I’m more impulsive with thrift-store purchases. I end up with pieces that are nice . . . but not perfect. They’re not exactly what I was looking for, or sometimes not what I was looking for at all. They often don’t fit that great. In the moment I love the piece so much that I figure it’s no big deal that it’s a large size, but then I never end up wearing it. They often don’t go with the rest of my wardrobe. A cool skirt doesn’t do me much good if I don’t have any tops that match. They aren’t a great fit for my lifestyle. For example, as a stay-at-home mom I need very few dressy items. And hoodies don’t work for me since I’m always running from one thing to the next — I need easy-to-remove layers. So they just hang in my closet for years at a time. When I shop at thrift stores, I end up with way too many items in my wardrobe that never get worn. This contributes to clutter and is a waste of space and money. Sure, I only spent $3 on that top; but $3 is too much money to spend on something that will just take up room in my closet. I’ve discovered that I’m much better off when I’m very intentional about my purchases — if I decided ahead of time exactly what I want, and then go out and find it in my exact size. That is a very unlikely scenario heading into a thrift store. Turns out, being intentional about my wardrobe usually means going out and buying things new. Even if I end up paying much more for each item, I save money (and time and closet space) in the long run for a few killer items that get worn over and over again rather than a closet full of duds. So my new approach to clothes shopping? I strive for a minimalist wardrobe made up of intentional, quality pieces. Despite their popularity and allure, I don’t have an official “capsule wardrobe.” I’m overwhelmed at the prospect of creating an elaborately pre-planned mix-and-match wardrobe. And honestly, thirty-three items seems kind of extravagant. Do most people have a lot more than that?! After purging my closets every so often, I’ll notice some gaps in my wardrobe (i.e. “I have, like, no nice skirts.”). So I’ll spend some time thinking about what kinds of skirts I would like. I’ll go on Pinterest to get some ideas, keeping in mind what kinds of tops/shoes I already have. In a few weeks I’ll go shopping for nice skirts and buy one, maybe two. Then I’m good for skirts for the next few years. Less decision fatigue. I know that when I go out, I have three or so nice tops and three pairs of jeans to choose from. (I always wear jeans on weekdays. Even in summer. Makes things easier.) Makes getting ready quick and brainless. Less clutter in my closets. Less clutter = a calmer brain. Less waste. I don’t waste money or closet space on clothes I never wear. I can get a few really trendy pieces and just wear them to death. I can be eco-conscious without having to stick to classics that will last eight years. For example, three years ago, I got a pair of kelly-green skinny jeans. I wore them virtually every time I went out, year-round (and still wear them frequently). If I had six pairs of jeans, that likely wouldn’t have happened, and I would have had to decide what to do with them in five years when they were no longer stylish. This way, they’ll likely be holey and worn out before I have to worry about that. Thrift-store clothes shopping might be realistic for me if I had plenty of time to make lots of trips to search the racks. But with two little munchkins in the house, I just don’t. Maybe you do, in which case I applaud your thrifty efforts! This doesn’t mean I’ll never browse through the women’s section at the local thrift shop. It just means I no longer go to St. Vincent’s or Value Village for the bulk of my clothing needs. I’ll probably continue to go to thrift stores for things like t-shirts and yoga pants for at home. I’ll still buy nice ones — I don’t like feeling like a bum — but they don’t have to be perfect. So second-hand is fine. How about you? 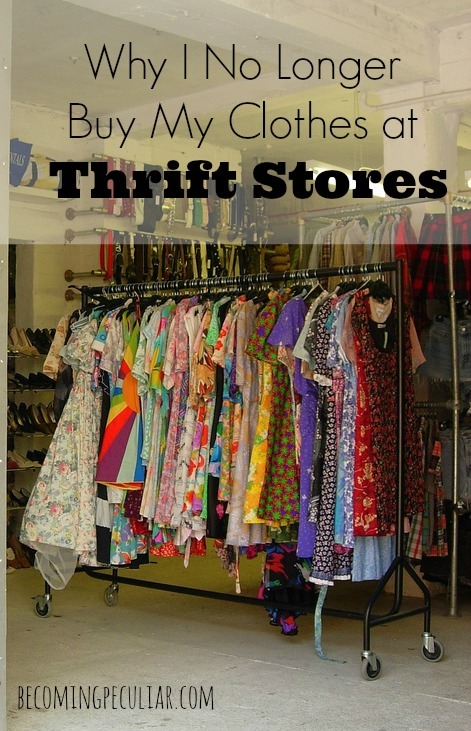 Do you still find thrift stores a worthwhile place to get your clothes? Do tell! Thrift store image courtesy of Laura Billings via Flickr. I don’t believe in owning a lot, but I do believe in owning some good kitchen tools. Being able to cook for yourself is, in my opinion, the most important step in self-sufficiency. It will save you money, it’s good for the planet, it’s good for your health, and will provide a lifetime of delight and satisfaction. Having a kitchen stocked with quality tools will make cooking that much easier and more enjoyable. Look for classic styles that won’t quickly go out of date. Avoid items that only serve one purpose. I also offered a list of common kitchen items I don’t really recommend. Today, I’m diving into the top kitchen items I do recommend, with suggestions for quality brands I’ve used and loved. (Disclaimer: contains affiliate links). I explained in my last post that I regretted most of the items I registered for nine years ago. If I could go back and register all over again (and if my guests weren’t all frugal Mennonites — *ahem*), here are the items I would choose. They are what I use on a daily basis now, as a seasoned home cook, and I love them all (and hope to use them for many years to come). They are made to last a long time, so you’re not constantly throwing things out and replacing them. Often, they are much more expensive than conventional options, but should save you money in the long run. They are as multi-functional as possible, enabling you to keep the number of items to a minimum (For example, I include a toaster oven, which can do the job of both a toaster and a microwave, eliminating the need for either). 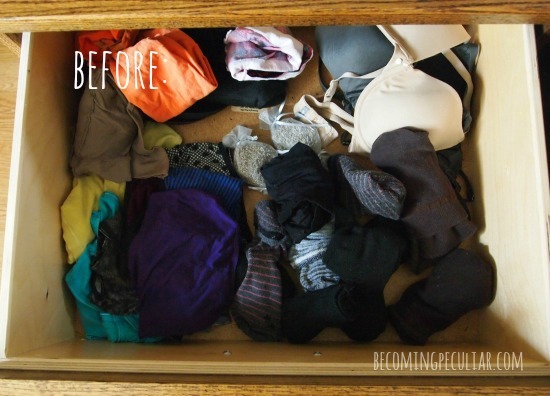 This reduces clutter and keeps things simpler. They are generally the least toxic and most energy-efficient options I know of. 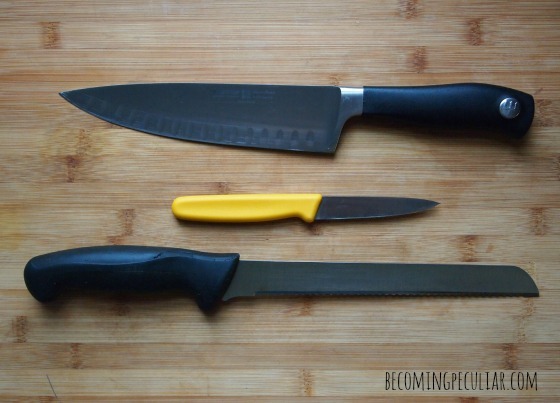 Knives: Don’t be fooled into thinking you need a whole big set of knives. I have found that with three good knives, you can do just about anything. Chef’s Knife. You guys: getting a proper chef’s knife changed my life. I’m listing this first because it is, in my opinion, the most valuable and important kitchen tool. I got a Wusthof 8-inch Chef’s knife two Christmases ago and will never use anything else. Nothing else compares in terms of versatility, balance, control, blade sharpness, and (according to Amazon reviews) longevity. I highly recommend that every home cook get the best chef’s knife they can afford. While I used to use a variety of cheap knives every day, I now use this one for virtually everything. Chopping, mincing, slicing, you name it. Every single day. I still have my old knives but never touch them. For me, this knife worth the extra cost because you’ll never need another knife. I also prefer to use it over fancy chopping and slicing gadgets. It’s faster and tidier. It’s nice to have a good knife sharpener to maintain it. I have this one, as recommended by a professional chef. Paring Knife. Even though I do almost everything with my chef’s knife, I occasionally need a small knife for things like trimming and coring fruits and vegetables. I currently just have a cheapo and it does the job; eventually I would like to get a Wusthof. Cutting Board. I recommend wood or bamboo — it’s gentle on your expensive knives; and more hygienic, durable, and eco-friendly than plastic. Although one lightweight, flexible plastic cutting board in addition to the bamboo one can come in handy when you need to whip out an extra one. Cast Iron Skillet. I can’t say enough about my 12-inch Lodge cast iron skillet. It’s inexpensive. It’s heavy-duty. It will last you the rest of your life — you might even be able to pass it on to your children. You can use steel utensils in it. It’s safe (unlike Teflon pans). It’s multi-purpose — wonderful for frying, sauteing, braising, grilling, you name it. I use mine every single day, for almost every meal. It takes some getting used to, learning how to use and care for cast iron (e.g. you never wash with soap, to preserve the seasoning); but once you get the hang of it, you’ll never go back. You also have to get used to the weight. I recommend getting two — a 12-inch and a 10-inch. Stainless Steel Saute Pan with Lid. 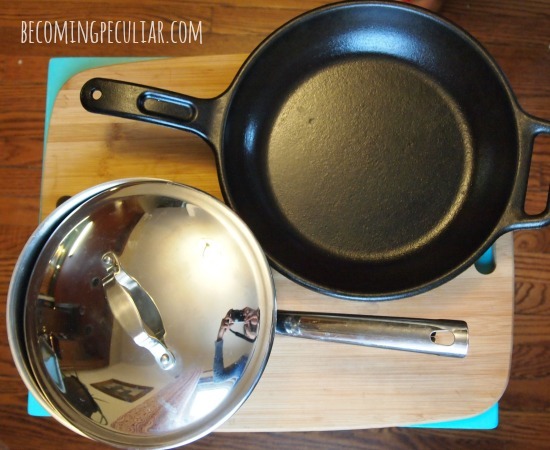 In addition to my cast iron, this versatile pan with a lid gets near-daily use, especially for sauces. Pot Set. Surprisingly, I have no opinion here. I had a fairy cheap set for the first 8 years or so and found it fine. Surgical Huck Towels. Forget traditional dish towels. Surgical huck towels are super-absorbent, durable, and lint-free. They dry quickly, which means they don’t get stinky. They dry glass without streaking. You can use them in lieu of oven mitts or pot holders — just keep them neatly folded a few times and tucked into your apron strings. I love them. Toaster Oven. I use my toaster oven for SO MUCH: for reheating leftovers (instead of a microwave); for toasting bread (anything from standard sliced bread to baguettes); and for baking small items like cheesecakes and pies (this uses much less energy than your oven). I highly, highly recommend this item. I’m sure they’re all great, though I own the Oster convection toaster oven. Blender or Food Processor. I still haven’t found the One Food Processor to Rule Them All. I started out with a cheap Costco blender. I do not recommend it. If I had to choose between a blender and food processor, I’d choose the latter. I own and love my Ninja Master Prep Professional — it’s super-versatile (it can function as a blender and food processor), it can blend anything, and works quickly. I use it for anything from smoothies to salsa to my date and nut balls. I can make my own peanut butter, and it will blend frozen banana chunks into a creamy, dairy-free ice cream. It’s very affordable, too. I just worry that the construction isn’t very sturdy and it won’t last long. I’ve had it for a couple of years without issue, but I’m noticing fissures in the containers which vexes me. If I had the money, I’d buy a Vitamix. Apparently it’s the bee’s knees of blenders. Basic Box Grater. I’ve used fancy food processors with grating and slicing discs; but unless I’m doing huge bulk amounts, I find a box grater (like this Norpro) much more practical because it’s easy to clean and take up less space. Plus, something in the motor of my stupid Hamilton Beach food processor broke and I had to throw it in the garbage. Sometimes manual is just better. Measuring Cups. Glass for liquid and stainless steel for dry ingredients. Please. Silicone Brush. I use it for all kinds of things, but especially spreading fat (butter, lard, olive oil, coconut oil) onto bakeware. With this little tool, I avoid all cooking sprays. Aerosol cans (like Pam) are horrible for many reasons; and I’ve never found a good reusable spray-can (I’ve tried a few). I prefer solid fats anyway for health reasons, anyway. Silicone Spoon. I love love love my silicone spoon, though of course a regular rubber spatula works (almost) just as well. Cooking Utensils. Growing up, my mom always kept a drawer bursting full with innumerable broken, half-melted plastic spatulas and utensils. 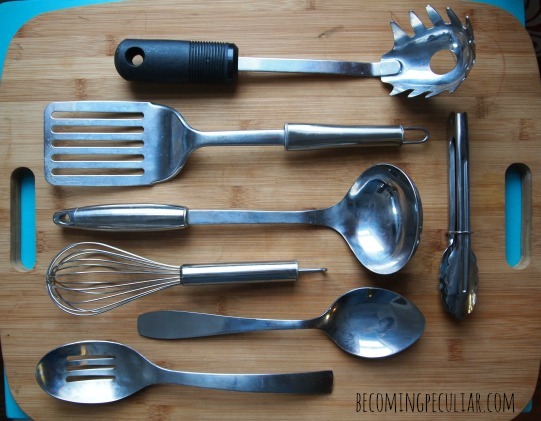 I have since learned the value of a few quality items — I recommend one stainless steel whisk, ladle, serving spoon, slotted spoon, spaghetti server, tongs, and spatula. (Duplicates are nice, of course.) You can use stainless steel with my suggested pans (above) without worry. A few wooden spoons round this out nicely. Vegetable Peeler. I haven’t found my peeler soul-mate, but I have used a lot of crappy ones, and they make life miserable. A good one is hard to find. I am happy with my newish KitchenAid peeler. Large (Metal) Colander. For draining pasta, homemade stocks, etc. Baking Stone. I got two of these Pampered Chef cookie sheets for Christmas two years ago and I am CRAZY about them. Nothing sticks to them. I bake crackers, cookies, buns, pizza, anything on these stones, and they bake beautifully and evenly. LOVE. 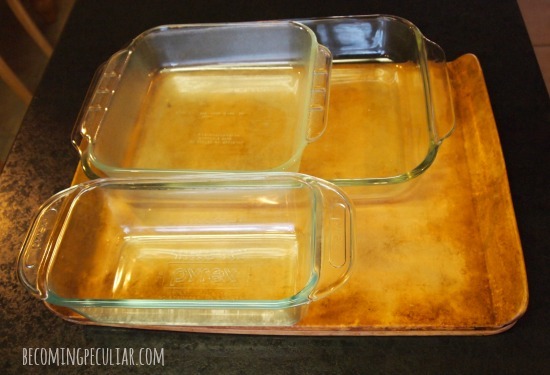 Glass and/or Ceramic Bakeware. For baking, you’ll likely need at least one of each: 9 X 13-inch pan; square 8 or 9-inch baking pan; 9-inch pie plate; and loaf pan. (I like to bake bread in bulk, so I actually have 8 pans). Electric Mixer. A hand mixer is totally sufficient for whipping cream and mixing batters if you don’t have a stand mixer. It’s all I used for the first eight years, and I can’t say upgrading to a stand mixer has made that big a difference. Metal Cake Pan and Muffin Tin(s). I prefer a springform cake pan (I have this one). My muffin tins have a nonstick coating, which i don’t love, but I usually use paper muffin cups. *I haven’t found the ideal solution for rimmed baking pans (when baking something roll-y, like roasted chick peas). I currently use cheap nonstick baking sheets. I would someday like to own one of these Pampered Chef stoneware bar pans. Corelle Dinnerware. This is one bridal registry item I don’t regret. Corelle dishes are affordable and incredibly durable — I still have almost every original piece from 9 years ago. I got the plain white (“Winter Frost“) set. Yes, it’s kind of boring. But it matches with everything, never goes out of style, and individual items are easily replaceable if broken — this style will never be discontinued. I can get funky napkins if I want to spiff things up. Mason Jars. I use all different sizes of mason jars for storing all kinds of things, from dried beans in my pantry to homemade yogurt in my fridge. I can jams, tomatoes, and pickles in them. 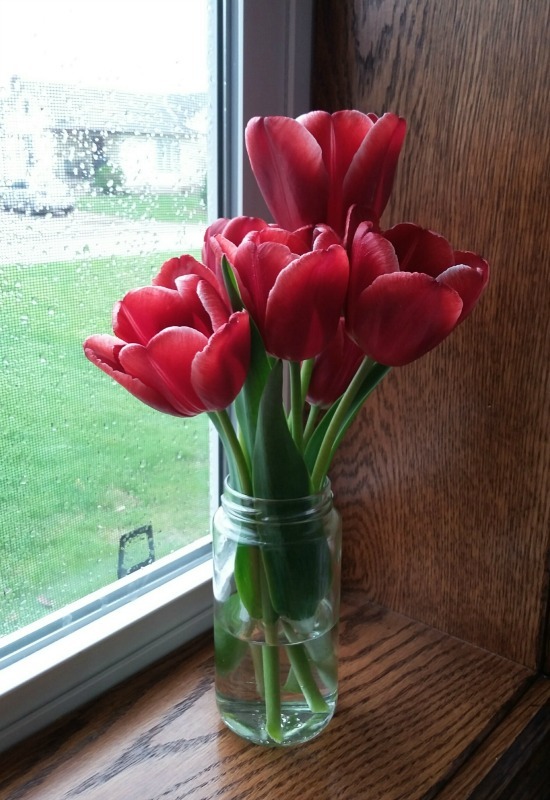 Mason jars are so versatile, I adore them (and they look cute, too!). It’s great to have a nice collection of every style and size, from half-pints to quarts. And I absolutely LOVE having the plastic caps (regular and wide-mouth sizes) for storage. Plastic Dry Foods Storage Containers. 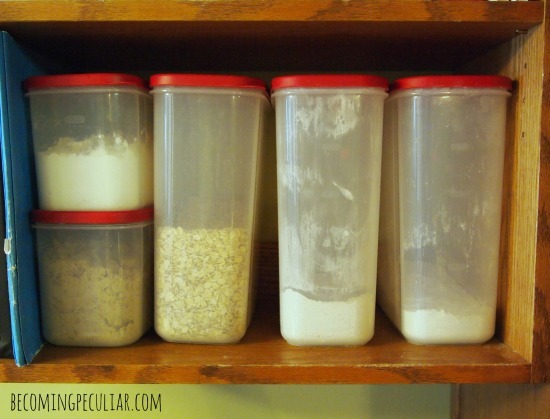 It’s also handy to have some larger, plastic, rectangular storage containers for bulk dry foods. Buying in bulk can save money and decrease packaging waste. I like my Rubbermaid Modular containers for storing things like flour, rice, and sugar. They’re affordable, durable, and more space-efficient than mason jars. Other Storage Containers. I always cook enough food at dinner to have leftovers for lunch. I have a variety of storage containers for that purpose. I personally love the Tupperware brand — it’s spendy, and you have to buy from a buy it from a consultant, but it lasts forever (with a lifetime guarantee). It also doesn’t contain BPA. I like to use glass containers, too, so that leftovers can go directly into the toaster oven to reheat. Well, I’m probably forgetting something, but these items come to mind as the most essential items. Do you agree? What’s missing from my list, in your opinion? Exactly a year ago, I shared my experiences and suggestions for going shampoo-free (or “no-poo,” as it’s often called on the Interwebz). 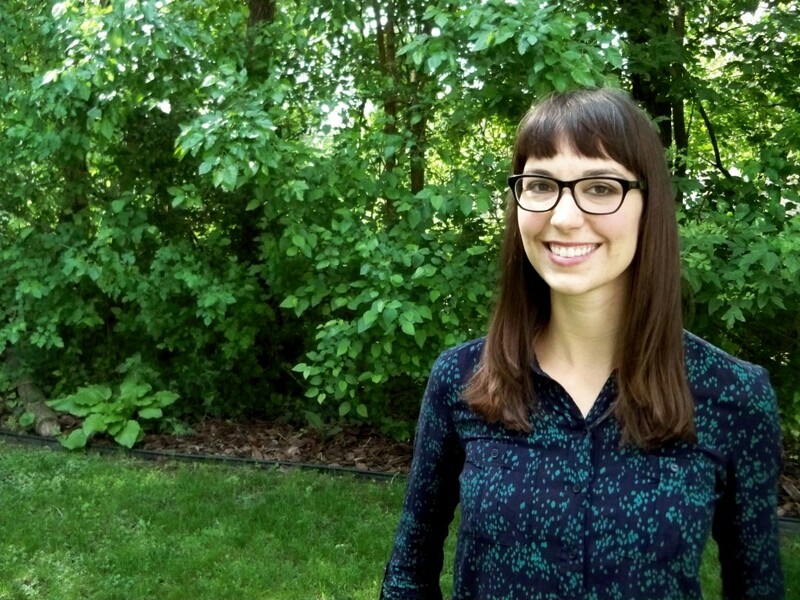 I explained how I go about washing my hair (with a baking soda rinse, followed by an apple cider vinegar rinse), and how you might have better luck if you slowly wean yourself off of shampoo rather than make the switch cold-turkey. That post has continued to be my most-read post of all time. (To be honest, that surprises me, because a lot of other people with way more successful blogs have already written about it, too.) I still even get regular comments on that post. It’s been pinned almost a thousand times. Turns out, there are a lot of people out there interested in ditching shampoo! To which I say: Woohoo! EAT IT, Proctor and Gamble! We don’t need your lousy products!! Anyway, I am happy to report that a year later, I love the no-poo method more than ever! It just keeps getting better and better. No joke! I’m comfortable enough with it that I’m able to whip up my rinses without thinking about it, and I never have those weird off-days anymore (where my hair would randomly get waxy and limp for no apparent reason). I love that I never have to buy shampoo (So frugal! So simple!). Instead, I buy one big jug of vinegar and a couple of boxes of baking soda (totalling about $5), and this will last me more than 6 months for my whole family. In the winter, I no longer have issues with static. I can’t explain this. But all my life, the dry air of winter has meant my pin-straight hair clinging to my face and driving me crazy unless I tie it up. The more I would touch it, the more electrical and crazy-making it would get. No longer. I don’t know why this is true, but I am loving this new quality. 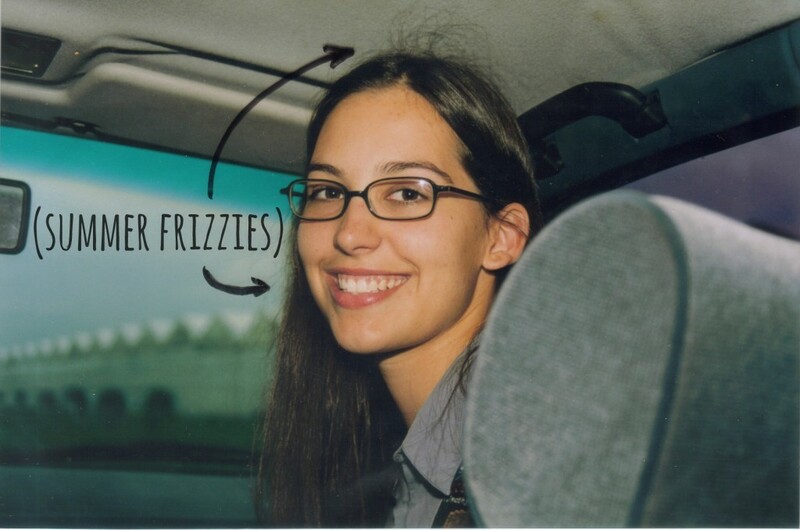 In the summer, I no longer have issues with frizz. Although my hair is straight, I’ve always had to blow-dry my locks during the summer to prevent my flyaways from frizzing up and giving me a hair halo. Throughout my teen and early adult years, I would always follow my blow-dry with a flat-iron run-through as well, to keep everything smooth. 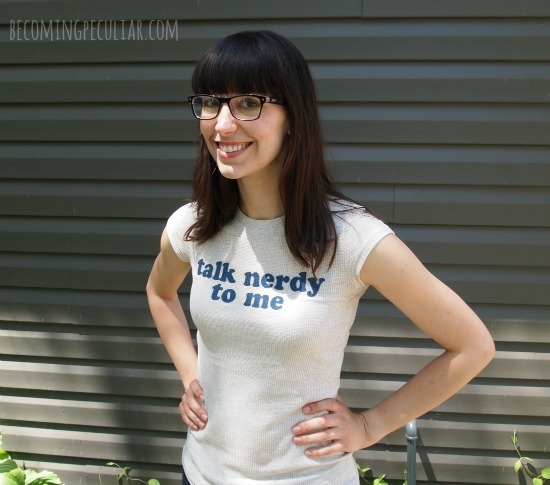 (This photo of me is like a decade old but it’s the best example I have of what I’m talking about). In the photo at the top of this post, all I’ve done is dry my hair with a hair-dryer (after washing with my usual baking soda and apple cider vinegar). No products, no flat-iron, no nothing. And since I’ve eliminated everything with synthetic perfumes and fragrances from our home, I’ve discovered another interesting change: my sense of smell is enhanced a hundredfold. Okay, so maybe not that much (a dozenfold? ), but I have been downright astonished at the difference. I can perceive smells I would have never noticed at any point in my earlier life. I’ve never had a particularly acute sense of smell, but that’s all different now. For example, I can identify my mom’s cooking by the smell of her dish soap on the food. From touching plates and utensils washed (and then rinsed) in her kitchen. It’s only the faintest smell, and not strong enough to be at all off-putting, but I can always notice, Ah — this came from my mom’s house. I once walked into a friend’s house and asked, “Do you have a flowering plant in here?” They didn’t think so. It only took me a moment to sniff out a blossom on their little citrus tree that they didn’t know was there. I could give you lots more examples but you get my point. Anyhow. I just wanted to say that I’m still delighted with the no-poo method, and I hope you consider giving it a try if you haven’t already. Here’s the original post on how to go shampoo-free, and another post offering additional tips. Have you tried going no-poo? How did you like it? And am I the only one who has noticed sense-of-smell-enhancement since ditching fragrances?? We got a new mail man last week. I was alerted to this change when I noticed crap mail showing up in our mailbox. Store fliers, ads for phone and internet bundles, stuff like that. I was surprised to see it. We hadn’t received crap mail in over a year. The only things we ever get in the mail these days are government and personal correspondence (i.e. income tax stuff, wedding invitations, etc). In other words, we probably get 3-5 pieces of mail in our mailbox a week. The sudden influx — 3-5 pieces a day — was alarming. By the third day, I knew I had to take action. I was quickly reminded why I’d decided to eliminate junk mail in the first place. Who wants all that useless paper piling up in their home? (Answer: not me). Within two days, the junk mail stopped coming. Ahhhh. It feels good to have less paper piling up in our recycle box. We stopped getting junk mail about a year and a half ago. I had purchased Tsh Oxenreider’s One Bite at at Time: 52 Projects for Making Life Simpler, and one of the projects involved reducing mail clutter. This included opting out of junk mail. At first I was scared to cut my junk mail. I’d miss all the sales! How would I know where to find all the best deals in town? But I decided to take the plunge, and have never, ever regretted it. 2. Because paper clutter in the house can quickly get out of hand, increasing your stress load. (See my thoughts on minimalism). 3. Because fewer ads in your life can help you reduce the number of unnecessary purchases you make, by eliminating temptation. I decided that these were all great reasons to opt out of junk mail. 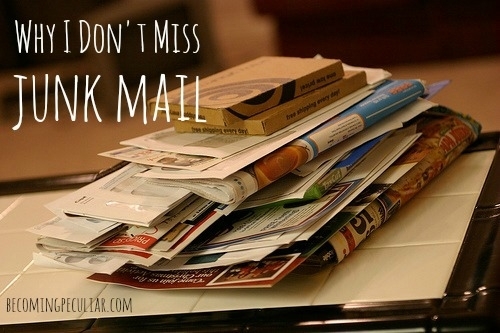 First, I’ll go over why I’m glad we got rid of the junk mail; then I’ll go over how you can do it, too! 1. The vast majority of fliers contain nothing of interest, and would go straight into the recycling anyway. These include stores that sell furniture, major appliances, tools, gadgets, etc. How many times in my life do I need to look at ads for refrigerators? Why would I need weekly fliers advertising these things? 2. The rest of the fliers tempt me with things I don’t really need. I’d rather not know about the new deals on smart phones or data plans. Often, when I do look at other peoples’ fliers, I suddenly feel like I need and want all kinds of things. Oooh, I would love a good mandolin for my kitchen. Hey, wouldn’t Lydia love some clothes for her doll? Oh, I could really use some accessories to update my wardrobe. Man, my phone is outdated. I avoid all this if I just avoid ads altogether. If I’m not aware of new products or amazing reduced prices on old ones, I can’t want them. 3. Grocery stores – i.e. the places I actually do shop — don’t really have sales on the things I want, anyway. What I want is local, organic produce; pastured meat, eggs, and dairy; etc. That stuff simply isn’t available from most grocery stores, and if it was, would almost never be on sale. I’m trying to buy less and less from grocery stores, and trying instead to either grow my own food or buy it from farmer’s markets, local farmers, local butchers, etc. Even flour, I now get from a local farmer. We get our fair-trade sugar, cocoa, and coffee from Ten Thousand Villages. So it doesn’t matter to me whether Cheerios are cheaper at FreshCo or at the Real Canadian Superstore. I don’t want them either way. Price matching isn’t something that concerns me. Grocery store fliers, therefore, don’t have much to offer me. 4. I also don’t use commercial shampoo, conditioner, deodorant, toothpaste, disposable pads/tampons, toilet paper, laundry detergent, sunscreen, or other conventional hygiene products, so those sales are irrelevant, too. 5. I’ve fallen in love with the reduced paper clutter and paper waste around the house. I love that we don’t have to organize and store stacks of paper fliers ever week. The only paper you’ll find in our recycling box, now, includes the occasional envelope, a few boxboard boxes, and some of Lydia’s old artwork. Simple. 6. If I ever do want to know what’s on sale at a given store, or if I’m interested in finding the best deal on a given item, the fliers are available online. (They’re a little more cumbersome to look through this way, but it’s okay for occasional use). Or I can just look at a friend’s fliers that week. 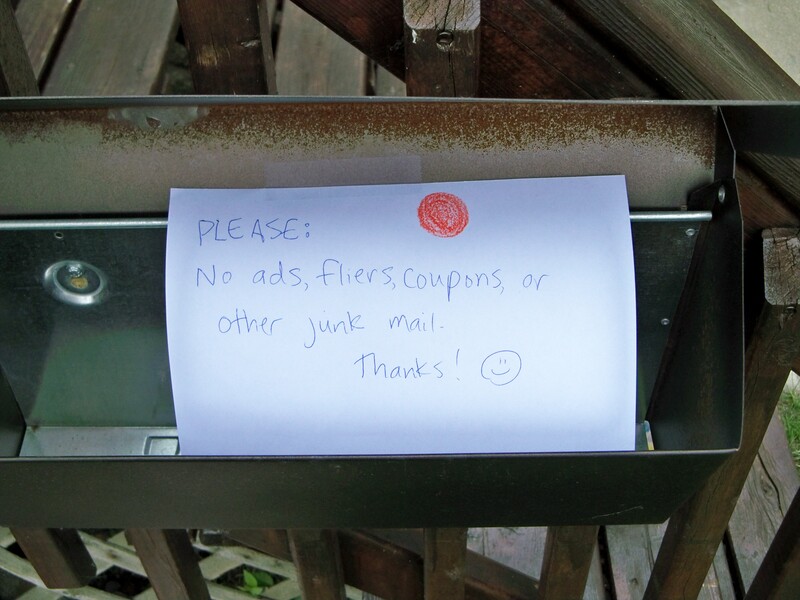 I also told the junk mail delivery person, when I ran into her one afternoon, that I no longer wanted the fliers. Done and done. #1: Red Dot Campaign – A good place to start. This site provides information on why and how to eliminate junk mail. #2: In Canada, there’s one main organization you can write to to have your name and address deleted from their mailing lists. Go here to stop the delivery of all addressed admail items. As far as I understand, you have a few options: go here and here to get your name/address removed from major mailing lists. In other countries, google “do not mail list” + your country’s name. What do you think? Have you tried this? 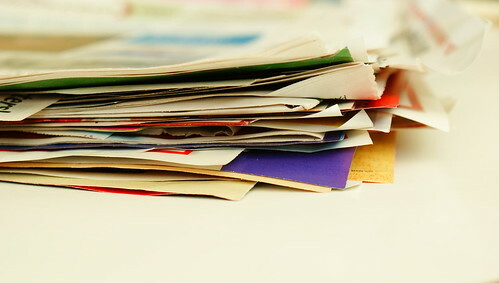 Ready to ditch the junk mail? Or is something holding you back? Tell me about it! Title photo courtesy of Charles Williams. Other images: 0Four and Kenn Wilson. We’re trying to avoid screens for our daughter before she turns two (and hopefully beyond), and we’re also trying to keep the number of toys we keep in the house to a minimum. That means we have to be creative sometimes. Keeping a kid happy and stimulated, while trying to get stuff done, without TV and electronic gadgets, requires a bit of imagination. This list of toddler-friendly items includes open-ended materials which encourage creativity more than electronic gadgets and registered characters do. That means you don’t need to replace them all the time: you can just repurpose them when your kid gets bored of a certain activity. Altogether, they probably cost us less than $30. 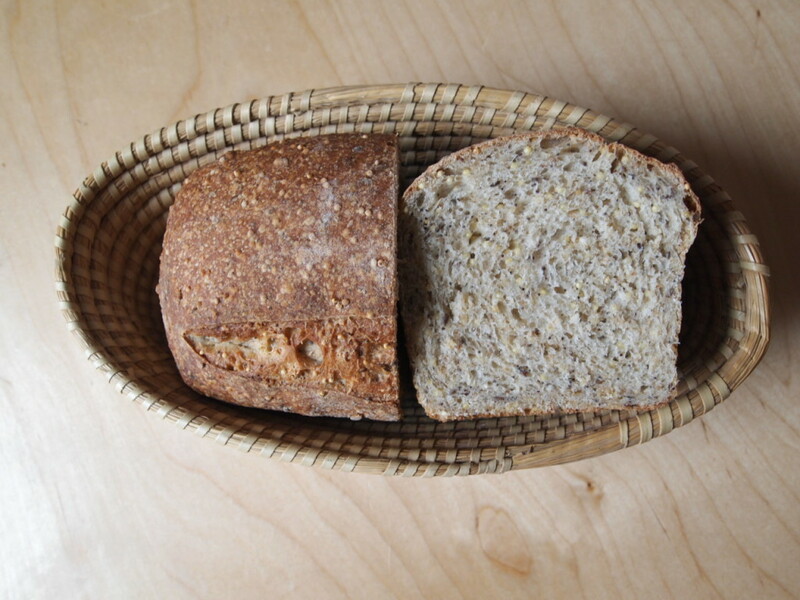 Looking at my photos, you might notice that we’re inspired by a lot of Montessori principles: we prefer natural materials, where possible, over plastic. We think beauty and quality matter. We don’t shy away from breakable materials (like glass), to encourage our daughter to be gentle and respectful of her materials. 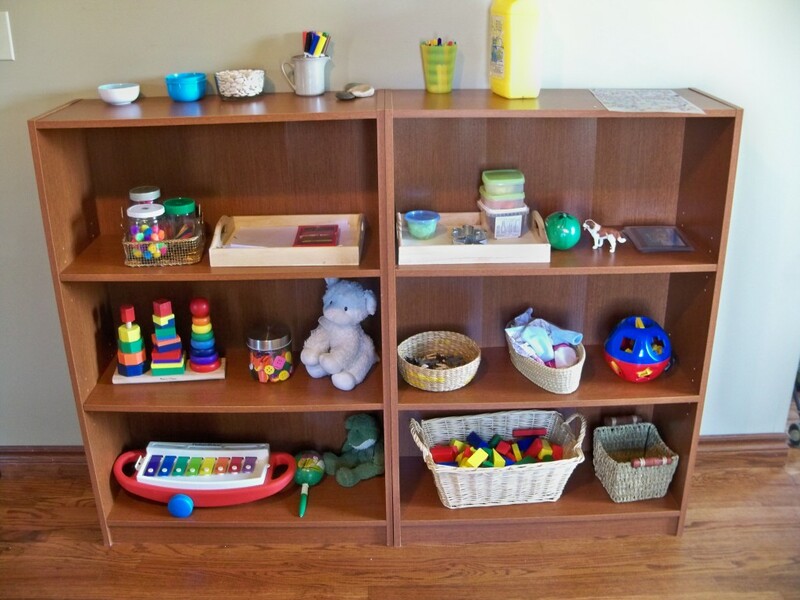 And we store toys on low, accessible shelves, instead of tossing everything pell-mell into a box, so that everything is kept orderly and easy for her to access, and to encourage respect for each individual item. (That being said, we still have plenty of cheap, plastic crap, and we let things get chaotic and messy on a daily basis). We also strictly limit the amount of toys our daughter has access to, so she isn’t overwhelmed by stuff and is less prone to devaluing her materials. And also so that I have less stuff to pick up. These shelves represent everything she has access to right now, aside from her doll, doll cradle, and doll stroller. I should also probably point out that almost all the items I’ve listed come with a warning, “Not for children under 3.” Apparently they’re choking hazards and whatnot. So give them to your child at your own risk, and stay close while he/she uses them. I have never, ever had a problem with Lydia putting these items in her mouth. And besides, she needs my help opening the containers holding things she could potentially choke on. I try to keep an eye on her when she’s using them. 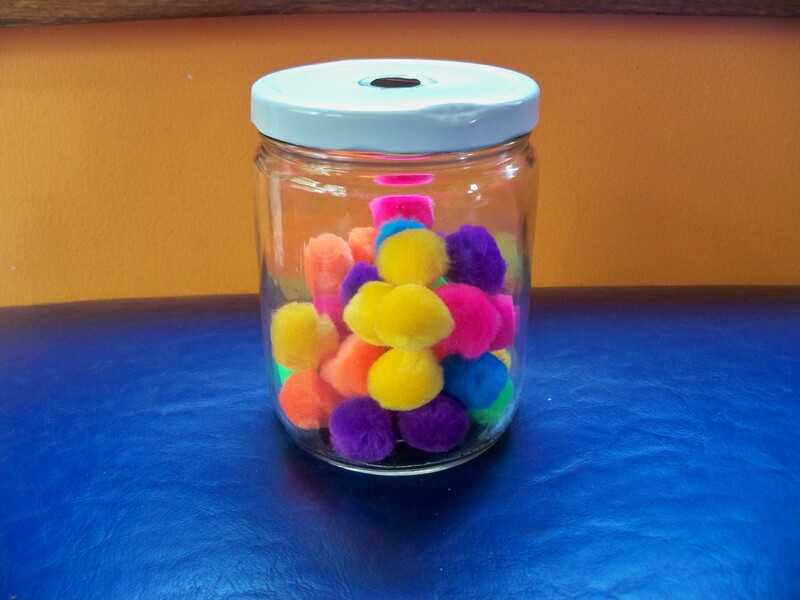 When she was about 17 months, Lydia could spend half an hour pushing pom-poms through a hole in a jar lid. Our most successful activity to date. Now, she can also sort them by colour in a muffin tin (though she usually just dumps them into the cups indiscriminately). When the pom-pom game got too easy, we had Lydia push popsicle sticks through a slot. It’s a little more challenging, because you have to get the angle just right. Again, this could occupy her for ages. 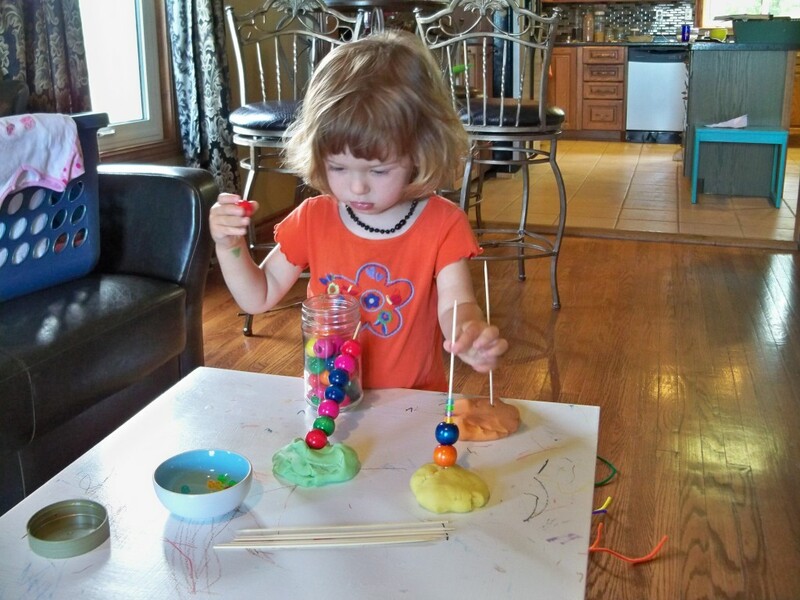 Popsicle sticks can also be used with play-dough (below), and eventually for building things. 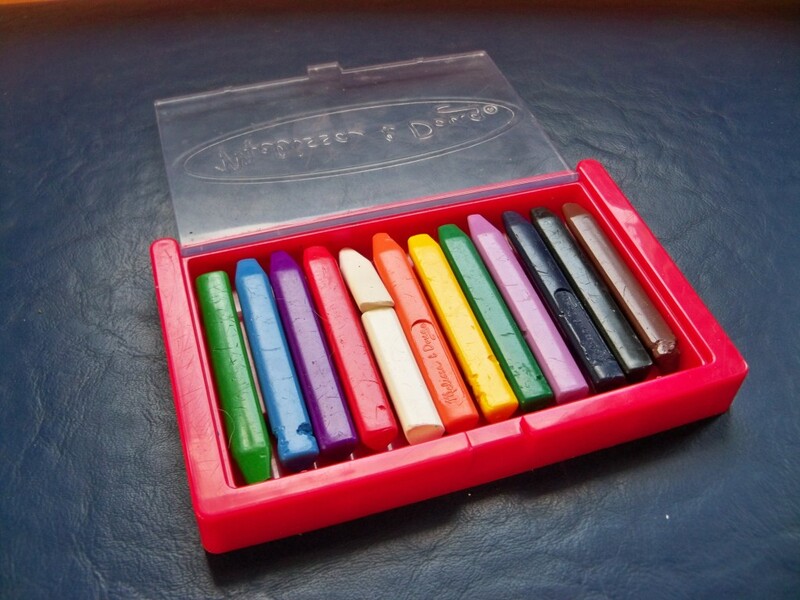 These crayons are made by Melissa & Doug, and they are the BEST. I’m a huge fan, and so is Lydia. She loves to draw! 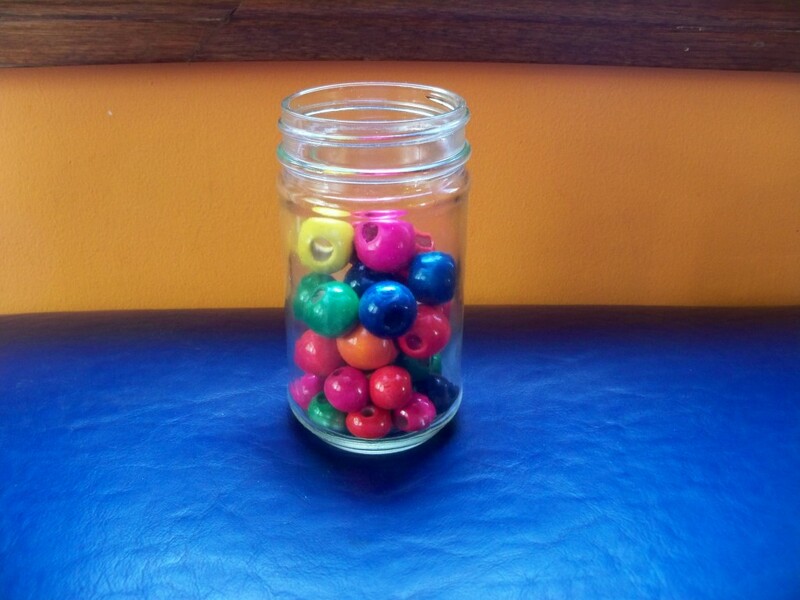 As you can see, these have been nibbled on a little bit, so be sure to keep an eye on your kid while she’s using them. These lovely beads can be used for stringing onto all kinds of things — pipe cleaners, leather laces, sticks, etc. 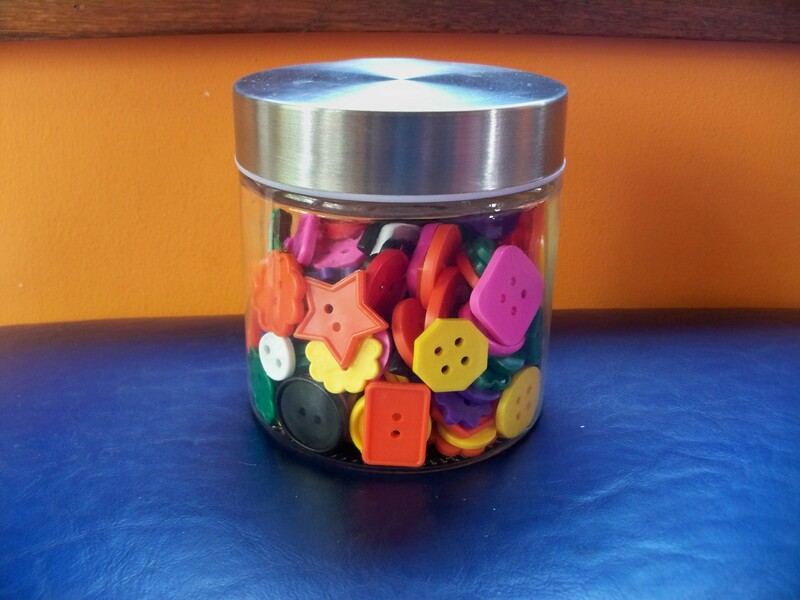 You could also use them for practicing identifying colours, sorting, etc. 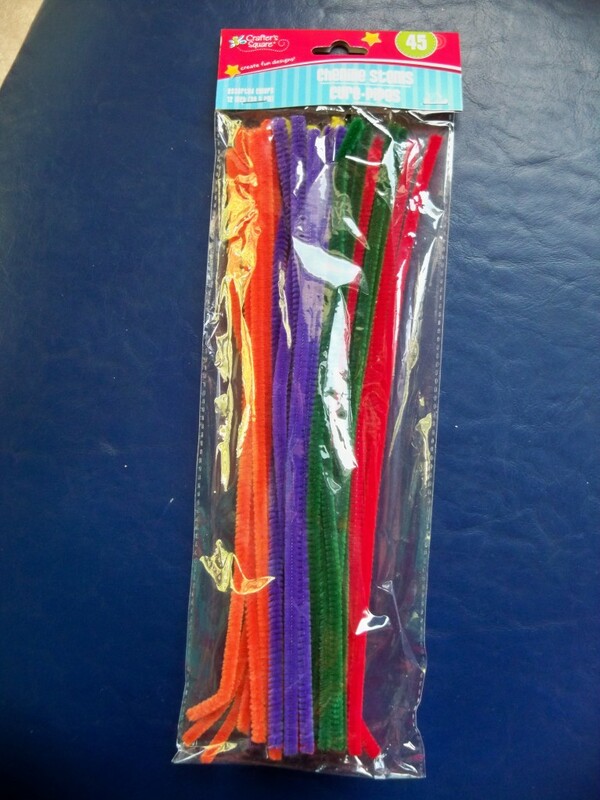 Also (apparently) known as “chenille stems,” these are great for little hands when learning to thread things. Yarn and string are generally too fiddly for most toddlers; pipe cleaners are a great alternative because they stay stiff. 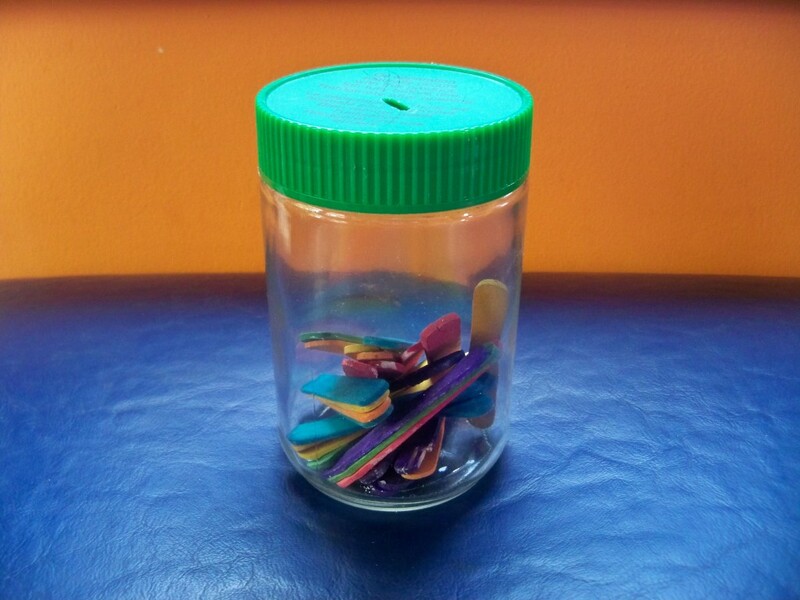 And you can thread them with all sizes of items — big or little beads, Cheerios, pasta noodles, etc. 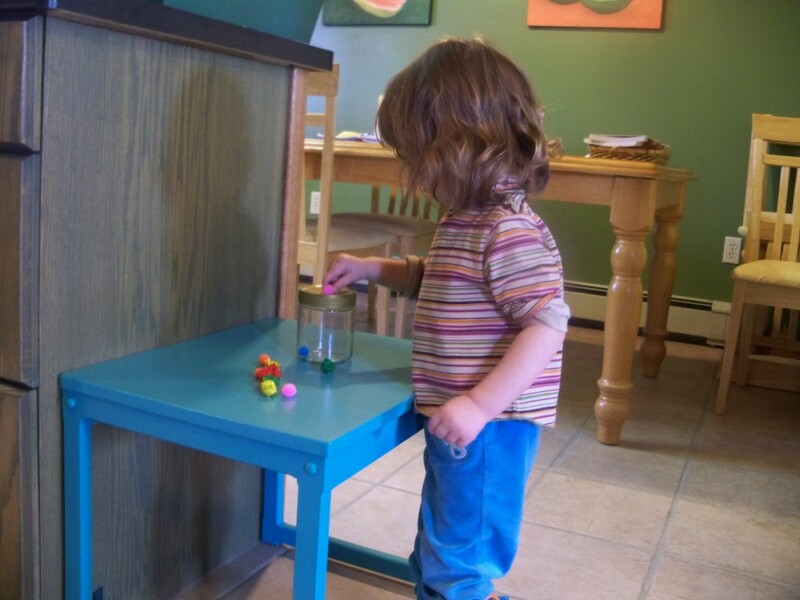 Your toddler can also poke them through anything with holes, like a colander. 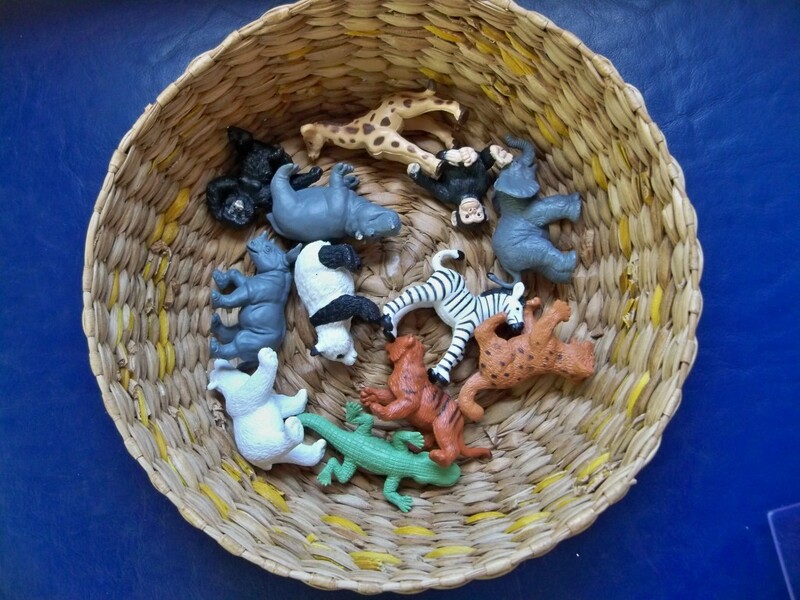 I am thrilled with these toy animals. I was looking for reasonably-realistic looking animals, but the gorgeous Schleich toys (at $6-12 apiece) were just out of our price range. I finally found a decent alternative: A Toob of animals (found — where else? — at Hobby Lobby). At less than $10 for a pack of 12, they were immediate winners. (We got the Zoo Babies; I’d like to get more in the future). Lydia loves her animals. She can distinguish between her tiger cub and her leopard cub, and between her gorilla and her monkey. 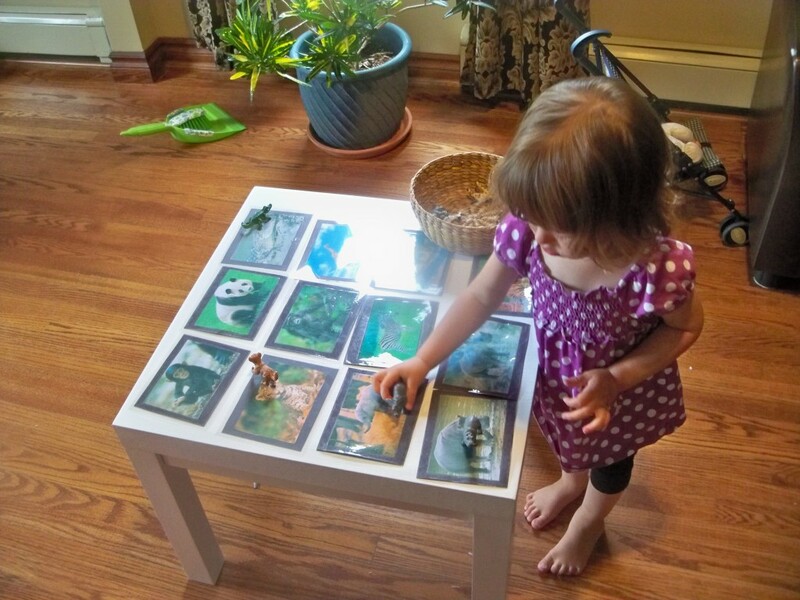 Since I am a big nerd, I spent one Sunday morning (when I should have been in church — *ahem*) making laminated animal cards that corresponded with her plastic animals, so she could match them up. (I got the idea here). She loves both the toys and the cards, though she has only played the game all the way through once. 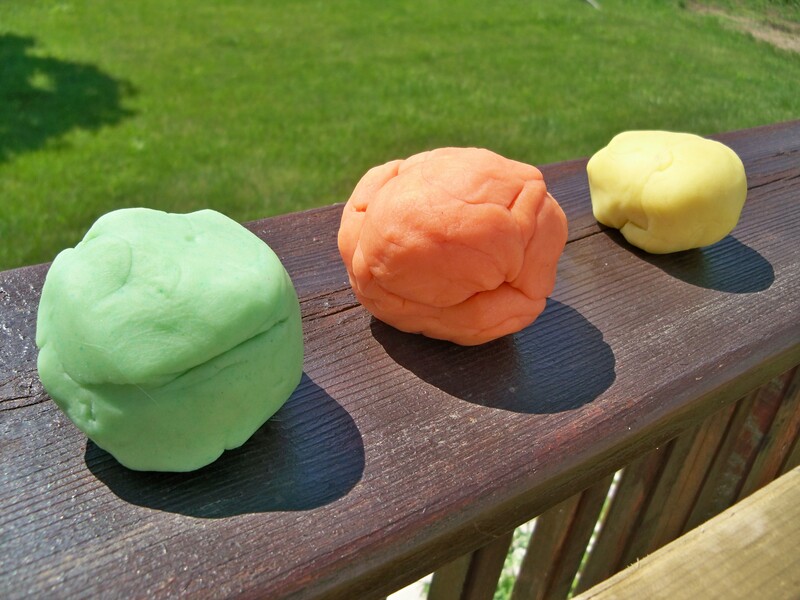 Don’t buy store-bought play-dough: make your own! It’s so easy and cheap! Play-dough provides lots of stimulating fun. 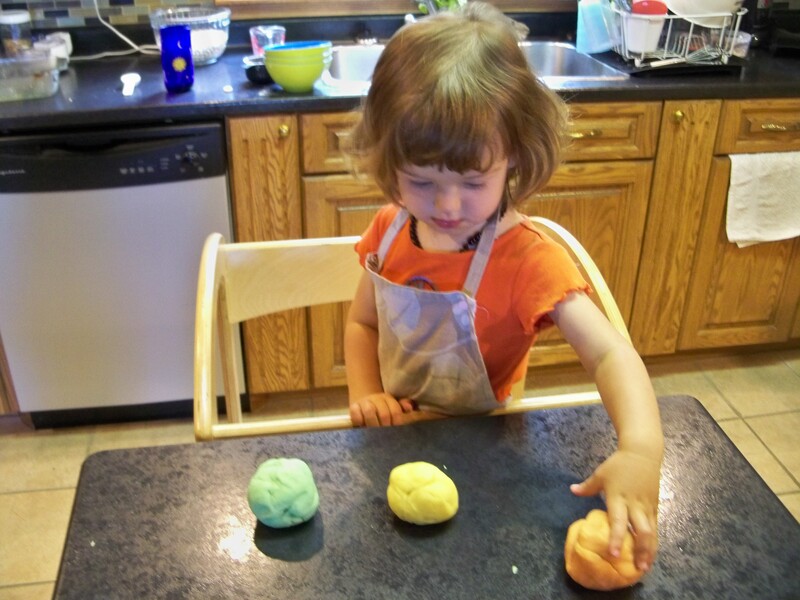 Lydia helped me make the play-dough (dumping ingredients and stirring), so even that was an activity. 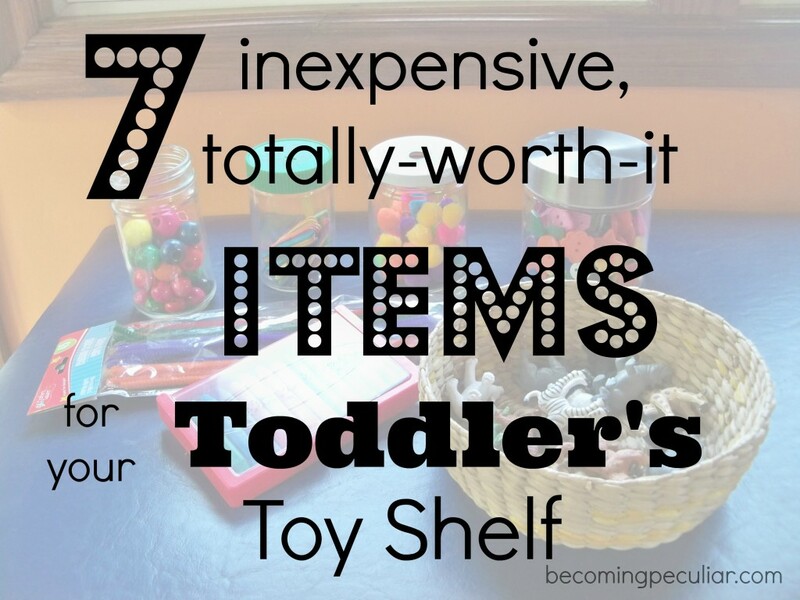 So these are some of our favourite cheap, simple, open-ended toddler toys. 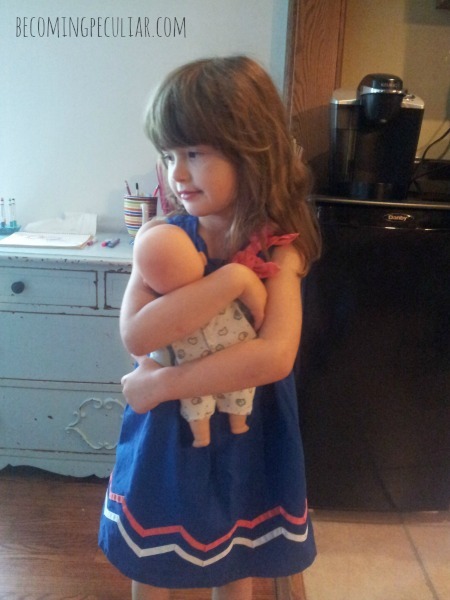 What are some other items your toddler loves? What do you do with them? I’m always looking for fun activities.